Eurogenes Blog: The teal people: did they actually exist, and if so, who were they? The teal people: did they actually exist, and if so, who were they? 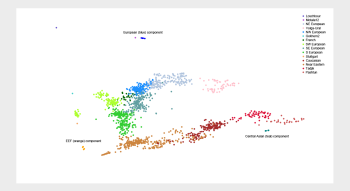 The ADMIXTURE analysis in Haak et al. 2015 includes a series of intriguing teal colored components from K=16 to K=20 (see image here). 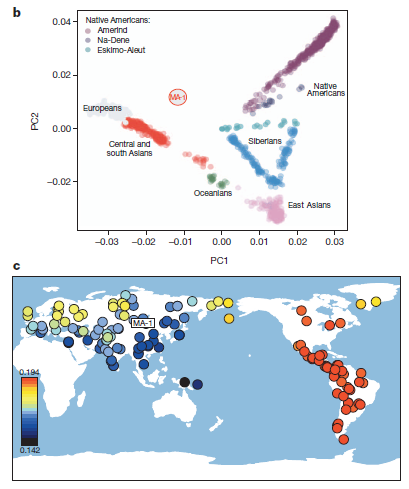 The main reason I'm so intrigued by these components is because they generally make up over 40% of the genetic structure of the potentially Proto-Indo-European Yamnaya genomes. But there's only so much one can learn by starring at a bar graph, so I thought I'd have a go at isolating the same signal with ADMIXTURE to study it in more detail. You can view the results of my experiment in the spreadsheet here. I wasn't able to completely nail any one of the teal components from Haak et al., because I don't have access to all of the samples used in the paper (I'd have to sign a waiver to get them). Nevertheless, the signal looks basically the same. Below is a bar graph based on the output featuring selected populations and ancient genomes from Europe and Asia. The Fst genetic distances between the nine components are available here. Note that the teal component peaks in the Caucasus and the Hindu Kush, and generally shows a strong correlation with regions of relatively high MA1-related or Ancient North Eurasian (ANE) admixture. On the other hand, the orange component peaks among Early European Farmers (EEF), who basically lack ANE. To learn about the structure of the three main West Eurasian components - blue, orange and teal - I made synthetic individuals from the P output to represent each of the components, and tested them with my K8 model. As expected, the teal component harbors a high level of ANE, while the orange component lacks it altogether. Refer to the spreadsheet here. It's very likely that the teal and orange components from Haak et al. share these traits. I think this is more than obvious by looking at their frequencies across space and time in Eurasia. I also analyzed the synthetic individuals with PCA based on their K8 ancestry proportions. The samples representing the orange component fall just south of the Stuttgart genome from Neolithic Germany, and this is basically where I expect Neolithic genomes from the Near East to cluster when they become available. Interestingly, the samples representing the blue component are dead ringers for Scandinavian hunter-gatherers (SHG). However, I suspect this is something of a coincidence caused by the small number of Western European hunter-gatherer (WHG) and Eastern hunter-gatherer (EHG) genomes in the dataset. The algorithm probably doesn't have enough variation to latch onto to create both WHG and EHG components, and in the end settles for something in between, which just happens to resemble SHG. But the fact that the orange and blue samples more or less pass for ancient populations leaves open the possibility that the same might be said for the teal samples. So did the teal people actually exist, and if so, who were they? My view at the moment is that a population very similar to the teal samples formed in Central Asia or the North Caucasus during the Neolithic as result of admixture between MA1-like and Near Eastern groups. This population, I believe, then expanded into the Pontic-Caspian steppe by the onset of the Eneolithic. Were they perhaps the Proto-Indo-Europeans? Probably not. I'd say they were Neolithic farmers who eventually played a role in the formation of the Proto-Indo-Europeans. In any case, someone had to bring the Caucasian or Central Asian admixture to the steppe, and I have it on good authority that it was already present among the Khvalynsk population of the Eneolithic, albeit at a lower level than among the Yamnaya of the early Bronze Age. Why would arguably 'more developed' southern Caucasians / Iranian origin peoples , who came in large numbers, adopt the language of Mesolithic hunters ? Anything is possible- there are no rules, but it seems less likely. Eastern European Mesolithic Y-haplogroups R1a and R1b came out on top, so why not language? It's debatable who was more advanced in the steppe environment, so no special pleading required. But not your first one. Like I constantly have to point out to Grey, why would we need to see this process of admixture as a "struggle" between foragers and farmers; in fact it certainly wasn't, and their interaction took on a far more complex nature. Secondly, we need a greater sample representation of the steppe and South caspian Region. Finally; there is no 100% reason to correlate language wih y haplogroups. Otherwise; we'd expect Hungarians to speak Slavic. Well, Hungarians are the exception to the rule in East Central Europe. Most people there do speak Slavic, which fits well with their Y-haplogroups. Yep But Ultimate Source is Further East Central Asia-SC Asia. Quick WE triangle based on this run: http://i.imgur.com/2ZJuzng.jpg, side by side with samples on K8 - http://i.imgur.com/e0W9E7U.png / http://i.imgur.com/7g1pLqH.png. Pretty much identical - EEF is slightly more shifted east on one than the other and CA slightly more north, pretty close. David, it just might be me, I don't know, but it looks like Lithuanians have european hunter gatherer ancestry over and above what might be explained by Yamnaya, or contribution from neolithic groups similar to stuttgart. On the spreadsheet, the Central Asian Teal peaks in a Georgian, at 62%. Coincidentally, West Asian in K7b also peaks in Georgians at 62%. And it turns out as about 60/40 ENF/ANE (with traces of South Asian). Anyway, what it looks to me is that the Caspian Sea might have been the place around which ANE expanded from the Mesolithic. It probably started in the south coast (I'd really like to see a genome from those Belt Caves there), and from there followed the coast to the north and then the rivers up to Samara. In the northern part they mixed with European type of HG, and in the south the mixed with Near Easterners (and more to the south with South Asians). Then in the Late Neolithic, the southern ones went north again, this time carrying ENF with them (and the Neolithic package). About who spoke PIE I don't have a strong opinion, but I see more options that it was the southern ones. Because of their superior level of development and because IE is also spoken south from the Caspian all the way to India. Sure, the Bronze and Iron Ages had a lot of action and could have spread the language south too, but it requires more complicated series of events. "why would we need to see this process of admixture as a "struggle" between foragers and farmers; in fact it certainly wasn't"
Is that the dictionary definition of "certainly" or your own? That's why I said it requires a complicated series of events. We still don't even know for sure if the steppe was responsible for spreading all IE languages into Europe itself. But I'm open to any possibility, because sometimes strange things happen. "Eastern European Mesolithic Y-haplogroups R1a and R1b came out on top, so why not language?" But this is still an assumption. We have no proof of what haplogroups carried the other population. "It's debatable who was more advanced in the steppe environment, so no special pleading required." Debatable if in the steppe herding had an advantage over hunting? Or do you mean that herding was a local development from the steppe people so they had the advantage of knowing the land? That's a very interesting exercise you made, David, thanks. On one side you confirm what appears in Haak 2015 but then you also expand with some neat extra information. I applaud. I wonder if you could do the following exercise: (1) run only ancient samples and see what actual components you get (possibly several for the various HG pops. ), then (2) run moderns on supervised mode for those ancient components. The result should be informative. As far as I can tell right now, the diffusion of the southern autosomal component(s) and mtDNA haplogroups across the steppe was a gradual process, possibly with an initial staging point at the southern end of the Khvalynsk culture, and at the moment I'm not aware of any evidence that it involved direct migrations from the Near East nor a largescale replacement of the native Y-haplogroups on the steppe. Lots of interesting samples are being tested at various places, so we should know much more soon. But yes, I can imagine that in a harsh environment like the steppe, which probably wasn't very receptive to the typical Near Eastern Neolithic package, knowing the land was an advantage. The steppe people did a lot of fishing, for instance, so something simple like knowing the best fishing spots might have been a big advantage. Could you also throw on LaBrana1? I'm curious about the difference. Thanks! Yes, more samples are needed to know how the Neolithic entered the steppe. The Samara ones didn't show a gradual process, but they were few and with a gap in between. But I think it's more or less obvious which kind of economy succeeded. Otherwise the HGs and the ex-farmers turned into HGs wouldn't have moved from the steppe. Changing the subject. Now that you isolated the teal component, can you think of any reason why Basques don't have it? For what we know, only if they were a mix of Spain_MN + EHG it would be possible. But that sounds like science fiction. Could be a strange drift, but Basques are neither a very small nor very isolated population. I mean, they're not an island or a remote place or isolated by any natural barriers. They are right in the continent, in a hospitable environment. True that a strong sense of identity since ancient times kept them from mixing much with their neighbours, but nothing too extreme to produce this strange effect. Irish, Icelanders, Scots and others should be more isolated populations. "Or do you mean that herding was a local development from the steppe people so they had the advantage of knowing the land?" Do you think R1a* could have evolved in the EE plain glacial refuge ? The Teal component basically looks like "West Asian". This Near Eastern-North Eurasian mixed population has been detected for years. Dienekes wasn't off at all by saying the West Asian component is a signal of people who came to Europe after the Neolithic. The same people impacted west Asia. There's something going on here. EHG is a major part of ANE in Yamna and modern Europeans, but so is "Teal". Teal looks like the best candidate for giving west Asia ANE, and seems to be connected to ANE in Central-South Asia. "Could be a strange drift, but Basques are neither a very small nor very isolated population. I mean, they're not an island or a remote place or isolated by any natural barriers. They are right in the continent, in a hospitable environment." I would definitely call that a small population. "Interestingly, our genetic results clearly correlated with a pre-Roman tribal genetic structure in this area that may be related to environmental diversity and which is still retrievable in the current population. Some authors think that this structure also correlates with the dialectal structure that subsequently appeared. It has been suggested that ancient patterns of organization around the main rivers and their tributaries could be causing the genetic structure and that the persistence of it may be related to a determined type of organization in small population units (Iriondo et al. 2003). This would suggest that both genetic and dialectal structures might have been driven by the same environmental factors that are still acting at present." So even though it might not be so inhospitable it might be region that caused little interest in people with large amounts of West Asian, or whatever the teal is, and at the same time there was a small closed society so if there was West Asian ancestry it could have been diluted from drift. Basques do show the teal component in most of the runs where it appears in the Haak et al. analysis, albeit at deflated levels compared to most Europeans. I have no idea why they don't show it in the K=20 run, or in mine? But there must be a good reason. I think we need a better quality sequence of La Brana-1. It actually looks worse than KO1 in many of the tests I ran. I don't know about R1a-M420, but I think R1a-M417 and R1b-M269 are from Eastern Europe. Yep, I agree, most west and Central Asians have very little ancestry from populations like the Samara Yamnaya. Pamir Tajiks obviously have the most, but even their estimate in my K6 test seems too high. The populations that spread Yamnaya-related ancestry around Asia probably mostly came from east of the Urals and I'd say carried very little European hunter-gatherer ancestry. Also, as I mentioned above, I've been told that Khvalynsk genomes have half the Armenian-like input of the Samara Yamnaya, so the proto-Kurgan steppe people really didn't have much Near Eastern ancestry. It might have only increased fairly late in the game as they expanded their range and inhaled nearby groups. I asked because EE was an undisputed refuge during the LGM, as was SW europe . It appears the data on other putative refugia (italy , balkans) is still far from certain, at this stage . I can't see any evidence for intrusive elements into EE apart from the Cucuteni Tripolye mix and whatever contributed to yamnaya. No Alberto only the right things happen:) and people (Including some staunches) should see the things objectively and deeply before making any conclusions. A pure case of Dogma and Wishful Thoughtfulness. "Also, as I mentioned above, I've been told that Khvalynsk genomes have half the Armenian-like input of the Samara Yamnaya, so the proto-Kurgan steppe people really didn't have much Near Eastern ancestry." Holy smokes!! Thanks for the tease. Very interesting. Because of our false predictions after teases about Haak 2015 we should be careful with this one. Safe to say they were very non-Near eastern though. I can't wait to see results from Andronovo and Afanasevo. Because of Kazakhs my guess is they had a noticeable amount of WHG-related blood, like Yamna. Maybe a "Teal" people made a big genetic impact all over Asia, while IE speaking Yamna-like ones didn't. Don't you think a bit the opposite of that ''thoughtful'' conclusion is more logical and scientific?. I think there are other possibilities, like Teal being PIE. I lean towards Samara Yamna types spreading most IE languages. It's so complex, alot is possible. Nirj buddy ; I'm not sure about R1b still (it's older and more widely spread) ; but Based on current phylogeny, geostructure and ancient DNA, it looks like R1a, at least M417 and below, is indeed EE . Do you know something we don't ? You should also try a few African Pastoralist groups. See if they pop any teal. Datog, Hausa, Fulani, Luo, etc. "EHG is a major part of ANE in Yamna and modern Europeans". The few clues we have about EHG admixture in Europe show rather the opposite. I haven't seen any test that confirms any significant amount of EHG in Europe. Quite the contrary. David made a K9 test with EHG cluster and a Central Asian cluster, and EHG turned out to be a thing from the Urals to the East. West of the Urals it decreased rapidly, and it's only significant (though single figure) in the extreme east and north or Europe, with only traces of it up to the British islands (and absent in all the south). Chad run some D-stats comparing modern Euros with EHG, Motala and Loschbour and he said that Loschbour dominated clearly in all of Europe. They're not definitive proof, but it's the only clues we have for now. I was even speculating due to this that maybe Ukraine didn't have EHG (like Samara) but WHG (like Hungary) so West Yamnaya could have taken all their ANE from the "teal people". Again, just speculation, but a possibility nonetheless. We still need more samples to really know what happened. @Dospaises: the ethnic Basque population overflows the official Basque Autonomous Community borders. In fact, genes-wise it overflows the generally acknowledged Basque Country (7 provinces, Euskal Herria), particularly to the south (La Rioja, NE Castile), the east (North Aragon) and notably the North (all Gascony and probably further North into France). Anyhow, let's say it's 3 million people, that's quite larger than many sovereign states in Europe. Basques are 10 times more numerous than Icelanders, almost 4 times Cypriots, more than twice Estonians, larger than Latvians, perfectly comparable to Lithuanians or Albanians, and not significantly smaller than Croats, Irish, Finns, Norwegians or Danish. Regardless. If there is a lack of "teal" in Basques (not sure because that depends on the K level in Haak's), then it must be attributed to lack of IE influence (logically). That same lack of teal component at K=20 is also apparent in Spaniards anyhow, so it's a wider issue than just Basques: at K=20 the "teal" and therefore the apparent IE genetic influence decreases clinally to the West and particularly to the SW, where it becomes zero. Or are you talking of something else? "Good idea, but I don't have enough high quality ancient genomes for that". Spaniards don't lack the teal at K=20, the Spanish North do, but they're the Spain Pais Vasco samples from the 1000 Genomes. So they're probably of Basque origin. @Davidski: "I have no idea why they don't show it in the K=20 run, or in mine? But there must be a good reason". Intuitively I'd think your run is the best, probably because you did not use an absurdly large global sample. I already suggested that Haak's K=20 could be more realistic for Europe than the supposedly best K=16, whose cross-validation optimal is relative to the global nature of the sample and may well be different for Europe or West Eurasia. If you used only West Eurasian and South Asian samples and you checked cross validation, then your run is almost certainly the best one, and also the one that makes best sense and where "teal" is revealed as the Caucaso-Baloch component already found in modern population analyses and now very apparently shown to be directly related with Kurgan/IE expansion in Europe (not necessarily in South Asia though). Alright. I didn't know that. If they are Basques, why label them as "Spanish", I wonder. I thought they were a sample from Aragon or something like that, much like "French_South" are Gascons from Bearn (i.e. Romance-speaking ex-Basques). Then there's no Spanish proper sample in Haak's paper, at least I can't find it. "Then there's no Spanish proper sample in Haak's paper, at least I can't find it." There is. The Spanish group is a larger one more to the left from the Basque, Spanish_North and French_South. At K=20 Spanish also show very few teal component. Btw, which events do you think that made Spanish and Basques slightly different genetically? My own thought is that during Ancient times (Roman/Visigoth times) most of Spaniards (or at least non-Mediterranean ones, and certainly northern ones) were probably just like Basques. But then Spaniards got two influences, the North African one during the Islamic times (which made them more "southern") and the mostly French (and other Euros) influence during the re-population of the re-conquered areas by the Christians (which made them more Eastern and West Asian). Or do you think it's due to other events? If the east asian admixture of Kazakh is removed and post-islamic admixture ignored (i dont believe that it is very relevant) than pre-Kazakhs look like 40 ANE, 40 ENF and 20 WHG. But it is not unlikely that the actual ANE part was a bit lower because i am sure that Kazakhs picked already ANE long before they arrived in modern Kazakhstan. The WHG in the non east-asian part of Kazakhs looks interesting but could theoretically but very unlikely be the result of recent admixture with Russians or Uralics. Tajiks have 10% WHG but why WHG is almost non-existing among Pashtuns? Maybe there were different waves of Indo-European tribes entering Asia. One rich in ANE, ENF and lower in WHG and another more rich in WHG (Scythians? Tocharians? ) Many told us that Scythians were european-like in genes and appereance but when it is true that they were so low in WHG than they were certainly different from modern Europeans and more like northern shifted Tajiks. I hope they will release the results for adna of Andronovo and Afanesovo soon so that we can better understand what happened in Asia when Indo-Europeans arrived. "Basques do show the teal component in most of the runs where it appears in the Haak et al. analysis, albeit at deflated levels compared to most Europeans. I have no idea why they don't show it in the K=20 run, or in mine? But there must be a good reason." 3 out of 5 individuals have no teal in your jpg. The 2 that do have extremely low amounts compared to the Spanish and French and very low amounts compared to the Spanish North. The Basque are different and I still think the reason is because of what Martínez Cruz et al. pointed out about them being small population units organized in specific areas of the Basque country. If she were to have done whole genome sequencing on the individuals she could've had a chance of finding out how far back the TMRCA of most of them is. That would have given us a lot of info about why they are so different but with so much P312 which is most likely a majority DF27. "Anyhow, let's say it's 3 million people, that's quite larger than many sovereign states in Europe. Basques are 10 times more numerous than Icelanders, almost 4 times Cypriots, more than twice Estonians, larger than Latvians, perfectly comparable to Lithuanians or Albanians, and not significantly smaller than Croats, Irish, Finns, Norwegians or Danish." So those places are tiny. Basque country is small. "Spaniards don't lack the teal at K=20, the Spanish North do, but they're the Spain Pais Vasco samples from the 1000 Genomes. So they're probably of Basque origin." If that is correct then the Basque must be the French Basque. They should have a separate non-Basque Spanish North that includes Catalanes, Cantabros, Asturianos, and Gallegos. ". I haven't seen any test that confirms any significant amount of EHG in Europe. Quite the contrary." In this analysis, "Eastern European' elements are already present in Mesolithic Europe, not only in SHGs, but even small but detectable amounts in Labschour. But the interesting thing is WHG elements appear in Samara Yamnaya which were otherwise not present in Samara HG. "West Yamnaya could have taken all their ANE from the "teal people""
That's improbable, at least in its entirety. Because even in the unlikely event that the Pontic steppe Mesolithic (pre-Yamnaya) people were distinctly 'WHG', they'd still have some (small amounts of) "ANE', or "EHG", or whatever you wish to call it. I.e. if the SHG samples were partly EHG, then why wouldn't Ukrainian HGs ? Going west, it seems to me that German BBs are indeed 50% Corded Ware Derived. The other 25 % each comes from WHG and EEF. This would naturally change as one approaches the Atlantic, Iberia, etc. The question Im not still entirely satisfied with is the origins of Corded Ware Culture. I think Corded Ware and West Yamnaya come from the same EHG/ WHG - mixed substratum which intermixed with 'West/ central Asian component, and not one (ie CWC) deriving from the other (Yamnaya) in any great part. Alberto, Steppe groups had alot of EHG and made a big impact on Europe, so Europeans have some EHG. A admixture tests done by Davidski or whoever else, isn't strong evidence against EHG not being in modern Euros. Loschbour fits better for everyone because everyone has more WHG than EHG. @Alberto: you're right, I was looking at an edited version (I removed all those noisy non-euro samples but apparently also took Spaniards with them by accident). "Btw, which events do you think that made Spanish and Basques slightly different genetically?" Definitely not the ones you say: the signature of Islamic influence is basically zero, maybe a tiny percent in the area of Granada. There is a very real North African genetic influence in the peninsula but it must be from long before any historical influence because its effects are not structured S-N but W-E. My opinion is that it fits well with Solutrean-Oranian prehistory but could also be some sort of Neolithic "bounce" influence. Whatever the case Galicians or Asturians are much more North African than Granadines or Valencians, what makes no sense with your recentist logic. As for Frankish influence it's much harder to detect (French and Spaniards are very similar) but in general I tend to dispute the fallacy of "repoblaciones" as a major demographic episode: most settlers were from nearby areas, most villages remained settled just as before and the Reconquista was just too fast (1033-1248) too allow for any major demographic change. Anyhow which free peasant from the North would want to go to settle as serf in the South? The fact that Southern Spain is dramatically structured around the heritage of feudalism and serfdom clearly indicates that the peasants were generally the same people who were already in Islamic times. In fact there was extremely strong resistance against the forced conversion edicts of 1492-93 by the feudal lords, who feared to lose most of their manpower. They basically turned a blind eye to their Morisco serfs' beliefs for economic reasons. This feudalist resistance was particularly intense the Crown of Aragon, yet there's no obvious North African signature in those regions. In brief: Iberians converted to Islam (although many remained Christians anyhow) and then converted to Catholicism, there is no apparent genetic signature of anything else, with very minor exception in East Andalusia, where Y-DNA J1 is slightly notorious. Just compare the Y-DNA pools of North Africa and Iberia: there's just no correlation that can be attributed to Medieval events. My take on the Basque vs mainline Iberian differences (other than attributable to IE influence) used to be based on Paleolithic archaeology, with the Basque Country staying all the time in the "French" side of things, while the rest experienced related but distinct processes, with cores in Valencia and secondarily Estremadura (Portugal). However the recent aDNA data shower suggests that Spain, at least the Ebro basin, has undergone major changes since then, and also did Basques (these mostly in the Neolithic), so the reasons must be more recent, maybe even from Roman times, after which Basques became independent and Spaniards/Portuguese remained under neo-Roman states. Essentially the same reason why Basque is not a Romance. Anyhow there's more affinity of Basques and Gascons (at least Y-DNA wise) with Eastern Iberians (i.e. real Iberians) than with Western ones (i.e. Celticized Iberians). But, really, only comprehensive genetic studies of the Peninsula and France will tell (and these are being sabotaged by neo-Roman chauvinism, it seems, whose dogma is: genes don't matter, law does). @Dospaises: I've been for long advocate of favoring larger population samples over smaller ones like Orcadians, Maltese, Druze or Bedouins but this is also subject to the informativeness that each sample can provide. It's undeniable that Basque samples are relevant, at least as much as Sardinians or Lithuanians (also "tiny" populations by your demanding standards) when analyzing European structure. Now, Orcadians, Icelandic Chuvash or Bedouins are probably not helping in most cases and can be safely scrapped from most analyses. Do you have the K8 analysis of the South Asian component in this run? Thanks. It makes sense why the populations of Europe and West Eurasia can generally fit as combos of those 3 K9, as they're within a triangle of them on this PCA. Is it possible to run that again with the Yamnaya, Middle Neolithic Europeans (Esperstedt, Skoglund, Iberia) and ENF from K8 also included or would the sample quality mean it gets too noisy? Alberto: David made a K9 test with EHG cluster and a Central Asian cluster, and EHG turned out to be a thing from the Urals to the East. There is the possibility of otherwise, but my thinking here would be that that "Central Asian" cluster in that run was a composite of the EHG in Yamnaya with whatever is non-Near Eastern in "teal", which it has trouble splitting apart for the same reason as splitting EHG and WHG, even though those are clearly different. ADMIXTURE is pretty sensitive to input populations and depends on what frequency differences it can take hold of. Gill Do you have the K8 analysis of the South Asian component in this run? Good question, as the South_Asian here does seem to contain quite a bit of at least ANE. It's not very ENA. Haak's run of ADMIXTURE also produced a "lime green" component at lower K which was like "teal" but seemed less HG (as the "teal" took some of the blue HG into it when it emerged). The main effect of "teal" compared to the K9 to K15 is to simplify the ADMIXTURE story in India, so I wonder if that is a side effect of merging some components that don't really differ in ratio in India and which drifted together in India, while being anciently separate. Or something. Another point about Haak's "lime green" K9 to K15 vs "teal" K16 to K19 is that "lime green" is absent in Sardinians and (for most K) Basques, while "teal" is present. This is true of David's teal though, so maybe teal here is already equivalent to the Haak K9-K15 lime green? Also, Alberto. Ancient DNA and archaeology supports a migration from East Europe giving modern Europe ANE. If Euros get a big chunk of their ANE from SHG, they still ultimately probably get it from EHG-type people. We already have Yamna and CWC genomes and they weren't "teal", and earlier Samara people were even less "teal"-like, so EHG is probably a major source of ANE in Europe today. As for the question if the teal component reached what was to become the Yamnaya area from the south or from central Asia – there is the fact that Yamnaya genomes from Samara are best approximated by a mix of Samara EHG + Tabassarans, according to the K15 4A oracle. This points to a southern origin near the Caucasus. There is also the fact that a Kurgan culture was present at an early date in the north Caucasus, and according to some even earlier in the Transcaucasus. On the other hand, in a large part of central Asia there was the Kelteminar culture, sedentary HG descended folks living from fishing. But my knowledge of central Asian prehistory is very shallow, so I can't say much definite about this. But then there is also the fact that the Yamnaya people have reduced affinity to MA-1, relative to the EHG. And I doubt that admixture from central Asia would have reduced this affinity. From the purely genetic point of view an association of IE with the teal component is the most natural assumption. It makes more sense than an association with the blue HG component. Teal is really non-negligible in all IE populations, whereas blue is notably weak in Armenians. And teal is weak in non-IE Basques and late IE-ized Sardinians. The origins of Anatolian IE and Tocharian are controversial anyway, there are good reasons to associate Tocharian with later arrivals along the Silk Road instead of the Tarim mummies (like haplogroup R1b in modern Uyghurs, and a vocabulary that includes agricultural terms for items not present in steppe cultures). And according to the recent Chang et al. paper the Greek-Armenian-Albanian branch was the third to split off from the remaining IE, around 3300 BC. It seems possible that this split occured because the remaining IE left West Asia and moved to the steppe. Greeks and Albanians have relatively strong West Asian ancestry and lesser North European one, and at least in the case of Greeks a large deal of this comes from Slavic admixture in the Middle Ages. Also it seems that the West Asian admixture arrived in southeastern Europe late, and since IE languages came to dominate there, it makes sense to ascribe them to those who came later than to those who had been there before. Armenians could be explained as autochthonous, their weak European HG admixture might be from admixure with their neighbours who have more. But doubts remain: What about that special Uralic-PIE relationship? If legit it would make a northern origin more likely. Though an alternative explanation might be contacts in pre-proto-IE times. Also what about Herodotus' account according to which Armenians had a Balkan origin? But the Armenians themselves didn't know such a tradition, instead their own mythical account of their origins places their roots in West Asia. There are a few hints that the Armenians had been present in West Asia for a longer time than 1200 BC, though they're controversial. In any case a steppe origin of IE would necessitate pre-Yamnaya expansions into the Balkans to explain the early split off of Anatolian, about 4400 BC according to Chang. It's possible, but not as self-evident as the later Yamnaya migrations, and not more plausible than an origin of Anatolian in the Transcaucasus. I agree that Basques with french Gascons are more similar than with other iberics but ancient-iberians never where or came anywhere near the Atlantic sea. They are basically only in catalan lands and also half of coastal southern France. Yes, it's too speculative at this point to estimate the EHG admixture in Europe. Checking the numbers it's true that most Europeans (if not all) have more WHG in any case, so Chad's D-stats were probably normal. And the synthetic sample for Central Asia in the admixture test can be easily misleading. Better to wait for more samples, because the more tests I see with current ones the more confused I am. I think that going back to Paleolithic times to explain the small genetic difference between Basques and Spaniards, knowing what we know today, is very outdated. Whatever event(s) made Basques different are most likely post-Roman. And the ones from the middle ages that I mentioned are the most likely ones. Admixture from North Africa certainly goes much further back, but it cannot account for the Basque difference (certainly not when compared to Cantabria or Huesca, for example). Plus West Asian admixture is a post Neolithic thing, so we need more recent events. We'll know soon enough with ancient DNA, but my guess is that in Roman times at least half of the Spaniards were just like Basques. How come?! They are the "tealest" of all: Yamna is like 50% "teal" and Corded Ware like 40% (hast some extra HG+EF of some sort relative to Yamna). Of course that "teal" (dark cyan) element in Haak's run may not be quite the same as Davidski's "teal" but that would be another issue. @Simon: "But then there is also the fact that the Yamnaya people have reduced affinity to MA-1, relative to the EHG. And I doubt that admixture from central Asia would have reduced this affinity". Excellent point! Also the teal component in Davidski's run seems exactly the same as the well known one Caucasus-Baloch component, which has no particular "Central Asian" tendency. "From the purely genetic point of view an association of IE with the teal component is the most natural assumption. It makes more sense than an association with the blue HG component". Yes again. This should be obvious: no pre-IE pop. in Europe shows "teal" either, at least not at any significant levels. Linguistically at least this sounds extremely far fetched, because Tocharian always appears to be the first IE language to branch out, so it must have got a very long history. Also there was no Silk Road before historical times and archaeogenetic evidence from Central Asia shows that there was no W-E genetic exchange (barring two border Mongolian Altai sites) before the Iron Age (while in the Taiga this genetic exchange is much much older instead). So basically you'd be talking of a very recent development, barely pre-Turkic, and it's really strange that Tocharian is so extremely differentiated when Indo-Aryan (incl. Scythian) is not. Makes sense if Western IE did not form before Corded Ware while Balcanic IE formed with the Balcanic Kurgans (leading to Cernavoda, Ezero and Cotofeni), almost 1000 years earlier. That's not important because their relationship with IE is filtered by the earlier Balcanic Kurgan cultures which are actually from Romania and Bulgaria, and anyhow would always be an elite dominance one (unless demonstrated otherwise). Also not sure why would you consider Yamna or its pecursors "North European", being clearly extreme East European (rather to the South of East Europe) and clustering best with European outliers like the modern Uralic populations of the Volga basin. @Gaspar: I think you very much overestimate the level of Iberian relationships with the Eastern Mediterranean. What we get from aDNA is that the main source of "Eastern Mediterranean" ancestry is Cardium Pottery (EEF) and that is also strongly affecting Basques. Then there was a sharp decline of that EEF affinity: known Iberian Neolithic autosomal samples cluster towards the East of Iberia (Sardinia, Italy), so there has been since then a Westernization not further Orientalization. Otherwise Phoenician presence was before the Barcas restricted to a handful of outposts, the most notable being Gadir (Cádiz). The Barcas did conquer much of Iberia but they did not have the time nor the manpower to settle it (in fact Hannibal's army was mostly made up of Iberian soldiers). Greek presence was almost exactly zero: Marseilles founded a couple of outposts at the Northern Catalan coast and there is some speculation about some other outpost being founded in Alacant (Akra Leuke), never confirmed by archaeological means. That's it: Greek influence in Iberia must be understood for what it was, an opportunity of the Iberian nation(s) to reaffirm themselves before the Celtic invasion and to reconquer Catalonia, re-establishing the Basque-Iberian connection lost with the Celtic aggression (connection that is quite important linguistically, it seems). Otherwise it's likely that Copper and Bronze Age Iberia had some relations with the Eastern Mediterranean: Cyprus probably and Mycenaean Greece for a short period for sure but these were not relations involving significant settlement in either direction and were not strong enough to leave any major evidence (there is evidence but it's rather subtle: West Asian elephant ivory, some glass beads, exchange of burial rites with Mycenaeans, nothing like pottery styles nor anything of the like). You are right, the teal component is definitely equivalent to the Caucasus-Gedrosia component. But, when the Caucasus-Gedrosia component breaks down into a Caucasus-centered component and a Pakistan-centered component, the Yamnaya score 28% Pakistani/Afghan/Northwest Indian/Gedrosia, and 5% Caucasian. In other words, their teal component ancestry is really shifted towards South Central Asia (or is just very specific to South Central Asia), not shifted towards the Caucasus or West Asia (this is based on running them through HarappaWorld). A side note, but it's interesting that Samara_HG scores 15% Gedrosia, and 0% Caucasus. But Samara_HG is 0% Near Eastern, so that 15% Gedrosia is probably tracking ANE affinity. @Alberto: "I think that going back to Paleolithic times to explain the small genetic difference between Basques and Spaniards, knowing what we know today, is very outdated." Probably. I can't help to be "old" and have been chewing on this issues before 2012. "Whatever event(s) made Basques different are most likely post-Roman". I am not so sure about that. Celtic invasions are pre-Roman and it was Celtic invasions what cut Basques (and Ligurians) from ethno-linguistic relatives like Iberians, while destroying others (like the once thriving pre-Celtic peoples of Portugal and Brittany, or even Great Britain). Also already in the Neolithic we see that the samples from Catalonia, Aragon and Burgos were pretty much mainstream EEFs (Sardinian-like), while the samples from the Basque Country are different: with much higher frequencies of mtDNA H and U, more modern and also probably more admixed with pre-Neolithic peoples. Iberia (Ebro basin for all we know as of now) was later re-Westernized (we still don't understand well how or when) but the Basque Country was already pretty much what it is now in the Neolithic already. "Admixture from North Africa certainly goes much further back, but it cannot account for the Basque difference (certainly not when compared to Cantabria or Huesca, for example)". It does in the Cantabrian case. In fact Cantabria is the easternmost province that fits with the "Africanized" Western Third of the peninsula (unless you also count Madrid), having important frequencies of E1b-M81. But in general terms you are probably right. It's difficult to judge because other than Y-DNA (Adams 2008) there are really no comprehensive studies of Iberian diversity and we don't understand well how the clinality of "Basqueness" or other possible distinctive populations (Andalusians and Catalans seem to be also somewhat distinctive) works in the Iberian peninsula. "... my guess is that in Roman times at least half of the Spaniards were just like Basques". My guess is that they were pretty much like they are today, with the normal exceptions here and there. @Senundzeit: "when the Caucasus-Gedrosia component breaks down into a Caucasus-centered component and a Pakistan-centered component, the Yamnaya score 28% Pakistani/Afghan/Northwest Indian/Gedrosia, and 5% Caucasian. In other words, their teal component ancestry is really shifted towards South Central Asia (or is just very specific to South Central Asia), not shifted towards the Caucasus or West Asia (this is based on running them through HarappaWorld)." For what it's worth, I never said Central Asia. But I do use the term "South Central Asia". People in genetics tend to use this term, because there are very strong genetic links between non-Turkic Central Asians (Tajiks, Yaghnobi people, and Pamiri people) and the people of northern South Asia. The genetic similarities between non-Turkic Central Asians and northern South Asians would be even clearer than they currently are, if Tajiks didn't have the minor Turkic admixture that they do display. Also, Afghanistan and northern+northwestern Pakistan tend to be understand as a continuation of Central Asia (for geographic, cultural, linguistic, and phenotypic reasons), and populations in that quarter are even closer genetically to northern South Asians. @ Maju "I think you very much overestimate the level of Iberian relationships with the Eastern Mediterranean. What we get from aDNA is that the main source of "Eastern Mediterranean" ancestry is Cardium Pottery (EEF) and that is also strongly affecting Basques." This cardium Pottery also appears in Balkan old "illyrian " lands. it can only reflect trade either via Mycenaean, Minoan or Phoenician traders and maybe remotely with Liburnians, I doubt you can claim anything with this. The fact are the ancient and current markers ( cogonomes de Catalan paper )should a lot of east-med affinity. In regards to Celtic invasion ....we know the Spanish and French Basques had no link with the med, we know Iberians had no link with the Atlantic sea, the only people in between where Aragonese, Foix and anyone else I missed, The problem is "who did the Belgae-celts replace" . "Although, looking at the percentages, the Pakistani Baloch aren't really more similar to Punjabis and Sindhis, when compared to the Iranian Baloch. Punjabis have a lot more "NE Euro" than the HGDP Baloch, while these Iranian Baloch have the same amount of "NE Euro" as Sindhis. In fact, the Iranian Baloch are more similar to Indus Valley populations, as far as "Gedrosia" and "North_European" are concerned. And Baloch3 has more "South Asian" than the HGDP Baloch. The other two individuals have more "South Asian" than the Brahui and Makrani. My tentative idea here is that the tribal Pakistani Baloch are a remnant population, a group which has seen intense genetic isolation. The presence of a Dravidian group in their midst is quite suggestive." I don't suppose the HGDP sequenced the Y chromosomes of the Baloch/Brahui/Makrani for haplogroup classification? If they are the closest living link to the first ANE<->ENF mix/exchange in South Central Asia from the early Neolithic period, their Y-DNA data would be revelatory about links to other populations and movements. I'm not sure why people tend to look for single components from unsupervised ADMIXTURE runs to describe the Proto-Indo-Europeans. I guess it might be some sort of instinct. But it doesn't make much sense from a purely analytical perspective. The assumption that the Proto-Indo-Europeans were initially a mixture of the blue and teal components, but probably with some of the orange near the Dnieper, would seem more sensible to me. You guys may be forgetting that most of the orange component is Loschbour like. The blue is a mix of Loschbour and EHG. The importance of WHG isn't a mystery. "I've been for long advocate of favoring larger population samples over smaller ones like Orcadians, Maltese, Druze or Bedouins but this is also subject to the informativeness that each sample can provide. It's undeniable that Basque samples are relevant, at least as much as Sardinians or Lithuanians (also "tiny" populations by your demanding standards) when analyzing European structure. Now, Orcadians, Icelandic Chuvash or Bedouins are probably not helping in most cases and can be safely scrapped from most analyses." I've never said that Basques shouldn't be used and I agree that they should be used. My point about the Basques being a relatively small population was in response to Alberto's statement that they aren't a small population. Martinez Cruz et al. called them a small population and when compared to the surrounding countries their statement is supported. Therefore, Alberto's statement that they are not a small population is incorrect. * Ive often stated this, but HUngary / Carpathian basin Bronze Age samples present problems: there is no evidence for "Yamnaya" intrusion, no west Asian, no EE. Bronze Age hungary seems to be a simple mix of Balcano-Danubian Farmer + WHG -esque peoples. This might be due to sample bias (with a mere n=2 for BA Hungary), the fact that the Carpathian basin was densely populated, and rather mixed. But nevertheless, the problem is there, but is being overlooked repeatedly. . When one combines this with the recent evidence from Aegean mtDNA (no real evidence for late Neolithic / EBA invasion), then we are left with the problem that the invasion of Teal people might not actually be explaining the expansion of IE- at least not for SEE (unless there was a 'pincer' movement from the Aegean - Anatolian and north -East Europe with the Carpathian basin / ECE being last to be affected. "What about that special Uralic-PIE relationship? If legit it would make a northern origin more likely. Though an alternative explanation might be contacts in pre-proto-IE times." There is nothing special (excluding drummed up theories of "Nostratic" by mediocre-ists trying to make a name for themselves) apart from early contact. This early contact could have happened regardless of where PIE first came, the Balck Sea, the Caspian sea, Iran, Abkhazia, Georgia, or Kiselovodosk. Thanks for your insightful comments. Brief question, when you say "recent evidence from Aegean mtDNA", to which study do you refer? The only recent ancient Aegean data I am aware of are those presented a week ago at AAPA and the Hughey et al 2013 Nature communication on Bronze age Minoans. Are you referring to these or another study? Yes - specifically, last weeks tid-bits. But note that this was just mtDNA, and who knows how the picture might change with ancient autosomal DNA and Y Chr. David, thanks for yet another excellent analysis! I have a couple of comments and several questions, as I have not been able to follow the 'post-Haak' discussions at your blog. To me it seems that the teal represents HG people originating probably somewhere east of the Caucasus and then spreading Southwards and South Eastwards during the late Neolithic, Chalcolithic and maybe Bronze age. Southwards they mixed with the Levantine farmers giving rise to modern Levantines and South Eastwards with indigenous people of south Asia giving rise to modern Kalash and Baloch people. Correct me if I am wrong, but the movement Southwards to the Levant must not have happened before the spread of agriculture from the Near East to Europe, since EEFs like Stuttgart, as well as modern Sardinians seem to lack the teal component. Another intriguing thing in this analysis is how the EEF component peaks in seemingly unrelated populations, such as Sardinians, Moroccans, Egyptians, Cypriots, etc. I am sure this issue has been extensively discussed and probably resolved by now, but just for the sake of asking, do we now (after the Haak paper and all post-publication analyses) have a clear picture of the origin of the Near Eastern people who spread agriculture to Europe? I guess we should be looking at modern Near Eastern populations with the highest EEF? Maybe somewhere in the North Levant? The teal component definitely looks like influence from a Mesolithic population from somewhere, at least in part. I was shown an e-mail recently from David Anthony in which he speculated that this component might be from a Mesolithic population from the southern steppe and/or north Caucasus. He gave his permission to share this info in public, underlining that it was just his opinion, but I won't post the e-mail here. If you're interested I can send it to you. Btw, this is also where I learned that, unlike the Yamnaya, Khvalynsk samples were only 25% present-day Armenian-like. As for the orange component, you basically hit the nail on the head. You'll soon see why. What do you mean by "southern steppe"? I'm disappointed it should be more less actually. David, if you please tell The Khvalynsk samples what are their dates and how many? NO! Cardium Pottery Culture is one of the two mainline (Thessaly-derived) Early European Neolithic, it is much much much much much older than those peoples you mention and has no relationship whatsoever with trade: it's a pattern of colonization nowadays confirmed by archaeogenetics. Basques and other Atlantic early farmers were also affected by it apparently, although this issue needs of more genetic research and is possible that Atlantic farmers had significant pre-Neolithic elements. Iberians looked to the Mediterranean? Sure but the relationship with the pre-Roman Basque Country is certain too (Iberian script in the Basque area, similitude of both languages, probable cooperation against Celts, etc.) Obviously Iberian, Basque and other now extinct languages belong to a unique linguistic family (Vasconic), which surely was the family of languages spoken by Early European Farmers in general: in the Valencian Country, in the Basque Country, in Sardinia, in Germany, in the Balcans (prior to the "Pelasgian" Vinca-Dimini invasions), etc. Everywhere west of the Bug River. Same genetics, same origin in Thessaly, same linguistic family. @Chad: "You guys may be forgetting that most of the orange component is Loschbour like. The blue is a mix of Loschbour and EHG." Uh?! Are you daltonic? Lochsbour is almost 100% BLUE, 0% orange - both in Haak's and Davidski's runs. There's nothing bluer than Lochsbour (except Kostenki 1 in Davidski's run only). @David, thanks. I'm surprised the MN samples aren't more parallel to Basques via WHG admixture - it doesn't seem like that surprisingly for whatever reason. I'd have liked to see the K8 ENF, but I can guess they'd be midway between Bedouin and EEF_orange, intersecting with the Sardinian-WHG line, and you've been kind enough to run these 3 PCA already. Maju: Uh?! Are you daltonic? Lochsbour is almost 100% BLUE, 0% orange - both in Haak's and Davidski's runs. There's nothing bluer than Lochsbour (except Kostenki 1 in Davidski's run only). When Lazaridis 2014 did formal modelling, they found that the farmer ancestry of Stuttgart was majority WHG clade. The orange component is likely to have less WHG-like ancestry than Stuttgart (as Stuttgart also has some blue) but the point Chad is making, if think, is that this effect will contribute to why Europeans end up closer to WHG than EHG in the formal D-stats. For Europeans usually the amount of cumulative WHG affinity they get via blue+orange is greater than the EHG affinity via blue (even though those were not the real populations that actually mixed exactly). Loschbour doesn't have orange, but if we formally model orange it will have "WHG". He meant the steppe area abutting the north Caucasus. I don't have that information. But based on this info, it looks like the admixture process started before the formation of the Yamnaya, and might have been due to increased mobility in the steppe and surrounds, as opposed to a major migration from the Near East to the steppe (or even a minor migration, considering the lack of the orange component there). By the way, I'll be running the K9 again in a couple of days. Those who have already sent me their data and want to be in the K9 dataset, please drop me an e-mail. ENF is hiding under the Yemenite Jews. Cheers. That makes sense as well. Davo can you please do a K15 for K01 from Gamnba (whenever you can) ? @Matt: "Loschbour doesn't have orange, but if we formally model orange it will have "WHG"". That's another story. It should not be WHG but something related that Lazaridis called UHG (unknown hunter-gatherers), probably Balcanic aboriginal peoples relative not just to WHG but also to EHG (not considered in Lazaridis) and SHG (not considered distinct from WHG in Lazaridis for most purposes). "When Lazaridis 2014 did formal modelling, they found that the farmer ancestry of Stuttgart was majority WHG clade". I think you are confusing things here: in supp. figure 14.3 Stuttgart is described as 30% "Basal Eurasian" + 70% "Western Eurasian". The Western Eurasian pop. Y ancestral to Stuttgart is "sister" to Lochsbour (WHG) but not Lochsbour (not WHG) but most likely a mix of West Asian components of Eurasian origin and Paleo-Balcanic peoples. Remember that "Basal Eurasian" is almost certainly NE African (Dinka-like) or in any case a "something" that diverged from the main Eurasian genetic pool very early in Paleohistory (at the OoA event). In supp. figs. 14.4, 14.6, 14.7, 14.8, 14.9, 14.12, 14.13, 14.18, 15.3 we see again the same pattern: "Basal Eurasian" + generic West Eurasian. Much of the same can be seen in the figs. of supp. data 16: EEF are "sister" to WHG relative to Ma1 but that's just saying that they are both core West Eurasians while Ma1 is further upstream in the West Eurasian sub-tree. In fig. S14.20 it is again the same but more refined: "Basal Eurasian" is assigned early on to "Near East" and Stuttgart is then described as a mix of NE2 + UHG, where UHG is a mystery (presumably Balcanic) population related to Lochsbour/WHG (but not WHG) and NE2 is sister to NE1, apparently leading to modern West Asians (or rather some of them). No apportions are given. Maju: I think you are confusing things here: in supp. figure 14.3 Stuttgart is described as 30% "Basal Eurasian" + 70% "Western Eurasian". The Western Eurasian pop. Y ancestral to Stuttgart is "sister" to Lochsbour (WHG) but not Lochsbour (not WHG) but most likely a mix of West Asian components of Eurasian origin and Paleo-Balcanic peoples. Sure, the West Eurasian Y (which in Laz into Stuttgart likely reflects a mix of true WHG and something else) is a sister to Loschbour; how this would seem to affect the D-stats is that it would be closer to WHG than EHG, so increase affinity to it relative to EHG. Early farmer input should increase similarity to WHG relative to similarity to EHG (based on the models). You're not really missing anything. The fact that the teal component must have ANE can be seen from the Haak ADMIXTURE figure itself. Both Samara_HG and Karelia_HG have this component at K=16. MA1 has even more of it. Something interesting about MA1 is that it has a beige component. This is an “Onge” component which first appears at K=11. The explanation that came to my mind is that both MA1 and Onge originated in the Indian Subcontinent more than 20,000 years ago. The ancestors of MA1 went north to Siberia. The ancestors of Onge went south to the Andaman islands. Any other explanation? Alternatively, the teal component in Yamnaya may reflect the Kartvelian-related influence in PIE. In David's analysis its western peak is in Georgians, which fits just perfectly. We know that an important population in eastern Anatolia and Armenia used to be the Hurrians. Their settlement area extended in a wide arc from near Ugarit and Hamath in Syria to Lake Van and Lake Urmia. Later in history, they set up the Urartian kingdom north of Lake Van. And according to linguists they may be related with the Northeast Caucasian languages. So these are kind of in the way, an obstacle for any expansion of putative Transcaucasian PIE westwards. The IEs would have to have migrated westwards north of them, through northern Anatolia, which can't be ruled out however. But if we consider Herodotus, according to him, the Etruscans were from West Asia, and the Armenians and Phrygians from the Balkans. A scenario of a PIE origin in West Asia like the one I described in my post above would mean that Herodotus was completely wrong in both cases, and this isn't very likely. Even a prominent archeological proponent of a West Asian homeland of PIE like Stanislav Grigoriev thinks that the Anatolian IEs had „backmigrated“ from the Balkans to Anatolia, and that the Greeks were from the area of Romania and ultimately from the steppe. I guess he thinks that this is archeologically the most plausible variant. As for the Armenians, Dienekes rolloff analysis of them as a mixture of Sardinians + Balochi yielded a date around 1280 BC, perfectly compatible with a late Bronze Age arrival from the Balkans. In that interpretation, the proto-Armenians were Sardinian-like which is possible, if their steppe admixture was low. According to the semi-mythological historiography of the Armenians on the other hand, their origins lie in Babylon. Interestingly, there was a tribe called Chaldaei in northeastern Anatolia, close to Armenia. So possibly there is some grain of truth in this legend. Although these Chaldaei hardly spoke an IE language, so the Armenian language may have had a different origin. According to Thucydides the Etruscans were „Pelasgians“ and related to the people who had lived in Attica before the Greeks, and he adds that they used to live until recently on Lemnos (where the related Lemnian is indeed attested), and were still (at his time) present on mount Athos. On the other hand, Dionysius of Halicarnassus claimed that the Etruscans and the Pelasgians were different populations. According to him, the Pelasgians were the original inhabitants of the Peloponnese, from where they had been expelled by some not mentioned other population. Dionysius describes how some of these Pelasgians went to northeastern Italy and later to the Tyrrhenian coast which they colonized according to him, from Latium to Pisa. At least the latter event makes it hard not to think of Proto-Etruscans, even though Dionysius denies such an identity. This would place the origin of the Etruscans in the Peloponnese. I think if the Etruscan-related languages arrived in Greece relatively late, around 2200 BC, the original inhabitants of the Peloponnese must have spoken a different language. But it's dubious that the later Greek historiographers still knew about this difference, unless some part of the pre-Etruscan population survived long enough, which is dubious. But this just shows that Herodotus' version of a West Asian origin of Etruscans isn't the only one, which complicates things a lot. "I described in my post above would mean that Herodotus was completely wrong in both cases, and this isn't very likely." You can't seriously think that what Herosotus wrote reflects a real knowledge of origins; events which occurred before he'd lived and in places he'd never gone ? The main reason to think that UHG is more akin to Lochsbour/WHG than to EHG is because Stuttgart/EEF do not have any apparent ANE, while EHG do. So UHG also did not have any ANE. But it's still not WHG senso stricto (Magdalenian people) but something else within the wider category of European HGs (no Magdalenian in the Balcans). "Early farmer input should increase similarity to WHG relative to similarity to EHG (based on the models)". Only relative to ANE. Otherwise I see no reason why UHG should be more akin to WHG than to EHG. Anyhow I seem to have misunderstood you when you said that "the farmer ancestry of Stuttgart was majority WHG clade". I thought you mean relative to West Asians, not relative to EHG. Sorry about that confusion. But it will most likely be ambiguous in the WHG/EHG divide, only true for the yes/no ANE divide. I suspect that Balkan HGs - at least during the Mesolithic- were likely to be very much like WHG. And the Carpathian KO1 certainly was. This is because the largest concentration of sites is in Northern Serbia- SW Romania. There is little down south, apart from few sites in Epirus and southeastern mainland Greece. "The thing is, there are very few Mesolithic sites in the Balkans. Greece has like 8". True but there was a clear founder effect in Thessalian Neolithic and the UHG must have been from the local HGs. It doesn't matter that they were few if they were actually incorporated at the Thessalian Neolithic genesis, what seems true. An interesting case here is Franchthi cave in the Peloponnese and one of the few initial European Neolithic sites outside Thessaly. This site appears to show Meso-Neolithic continuity and has been sequenced for mtDNA H(xH1,H3). Hence UHG may be at the origin of EEF mtDNA H. In any case it is a quite apparent example of locally rooted Meso-Neolithic transition, surely under influence from Thessaly. Another interesting site is Otzaki, a few kilometers inland from Sesklo and the very first site with Impressed-Cardium pottery. We don't know exactly why these two nearby settlements had such differences in pottery styles but a hypothetical explanation is that Otzaki is a more "native" site, while Sesklo would be the main colony. The later expansion of the two styles does not seem to bear any obvious signature of these initial differences (Mediterranean and continental EEFs look pretty much the same) but it's possible that there were such differences in the initial centuries. In any case, when we think about the very first European farmers in Thessaly, we must understand that they were initially a small population and that founder effects were surely important therefore among them, both for the West Asian (and African-like) legacy and for the European aboriginal one. In this context, even a small UHG population could have made a sizable impact, as seems to be the case. Also notice that EEFs do not show any remarkable appearance of Lochsbour-like admixture, and that's surely because their characteristic "orange" component was already homogenized before further expansion. "Even a small UHG population could have made a sizable impact..."
But the fact that EEF already seem homogenised only supports that there was little "UHG" IMO. Because Yamnaya clearly looks bi-componental. Why shouldn't the early farmers ? @Matt: "I think those Danube Gorge HGs are most like WHG". Do you mean Lepenski Vir? Anthropometric analysis published some years ago rather suggest they were related to the Pontic Steppe HGs and that they were intrusive in the Balcans (although much of the same can be said of Romanian Epipaleolithic in general). They were surrounded by the Neolithic colonization and eventually vanished. They might have been absorbed but at a later stage, not early on enough to make part of the founder effect. Also those would not have affected the Impressed-Cardium Pottery culture in any way, because this one expanded from Epirus to Dalmatia and Southern Italy and, from there, further West, never ever going through the inner Balcans. IF the UHG must be at the shared origin of both continental and maritime Neolithic, and it must, it must be a population from Greece. After the initial Greek Neolithic both cultural branches follow separate paths only touching (and sometimes overlapping) again at the end of their expansion: Bosnia, wider Rhine area, Britain (these last two assuming that La Hoguette and Dolmenism are derived from Cardium, what is arguable). Oops, the previous note was for Mike Thomas, not Matt. Sorry. @Mike again: "But the fact that EEF already seem homogenised only supports that there was little "UHG" IMO. Because Yamnaya clearly looks bi-componental. Why shouldn't the early farmers ?" Well, I'm not the one saying that there was some UHG, that's Lazaridis et al. Probably the apportion was small but not insignificant: 30% maybe? "published some years ago rather suggest they were related to the Pontic Steppe HGs and that they were intrusive in the Balcans (although much of the same can be said of Romanian Epipaleolithic in general)"
"They were surrounded by the Neolithic colonization and eventually vanished. They might have been absorbed but at a later stage, not early on enough to make part of the founder effect. " I don't think they vanished; in fact we know they didn't . And I wasnt making any references to "founder effects "
"Also those would not have affected the Impressed-Cardium Pottery culture in any way, because this one expanded from Epirus to Dalmatia and Southern Italy and, from there, further West,"
Well I agree with that; but if there was a mesolithic greek component ; it will have to be E-V13. We will hopefully soon know . @Simon: What if Etruscans and Pelasgians are just Vinca-Dimini people, who fled IE invasions? Of course there's a risk of over-simplification because West Anatolia, the Peloponnese, the Cyclades and Crete went through different stages than Thessaly, where the Vinca-Dimini people persisted (Rakhmani culture) until the Greek invasions, but still it's something worth chewing about. In any case we can think indeed of a wider "Pelasgian" (i.e. pre-IE Aegean) category, to which proto-Etruscans belonged, as well as the remnant Vinca-Dimini of Thessaly and others (Minoans even). This is a catch-all term with no certainty of ethno-linguistic affinity, of course. "I wasnt making any references to "founder effects "". If there's no founder effect, then it's not part of the orange component IMO. ... "but if there was a mesolithic greek component ; it will have to be E-V13. We will hopefully soon know". Most unlikely. We can track E-V13 and precursors through the Eastern Mediterranean coast to Palestine and Egypt and Sudan. E1b in Europe is IMO a very clear marker of what they call "Basal Eurasian" in EEFs, which is in fact NE African and something apparent in the archaeology of Palestine Mesolithic (surely also related to the Semitic genesis, via the arid hunter and pastoralism specialist population of Harifian). The most clear UHG marker is almost without doubt I2a, but there are surely others (I have already suggested mtDNA H for example). We already know that I2a was WHG- case in point: KO1, Labschour, the WHG-part of all the Motalas. A side note regarding the misnomer of the Pais_Vasco sample as Spanish North: In the preprint version of Lazaridis et al 2014, it was still called "Pais_Vasco", and this was changed to Spanish North in the definite version of the paper. I understand the reason why Chad described the majority of the orange component as Loschbour-like, but still find it necessary to point out that the most orange of all ancient samples, one of the HungaryGamba_EN farmers, still is very far from Loschbour in any PCA. This just to prevent any misunderstandings by less informed readers. You're missing a few things. The UHG is certainly not some late Balkan mix. These folks were present in the Near East for some time. Even Bedouins are probably only 55-60% BE. Levantines look like EEF, with a pinch more basal, some EHG, and SSA. Also, I think the Magdalenian are going to be more unimportant than you think. Are you suggesting that Teal and Orange represent analogous processes ? So, whats you're explanation of EEF (again) ? "Is there another explanation?" Yes. The common ancestor to MA-1 and Onge might not have been native to the Indian subcontinent. Another option would be central asia. EEF = farmers from the Fertile Crescent mixing with WHG-related hunter-gatherers in Anatolia and the Balkans. Another interesting detail from this run: Pathans show a good 10%-12% of blue, while on K8 they show hardly 1% WHG. The reason seems to be related to ANE, but the blue actually have some 18% ANE (like Motala) while EHG had some 38%. So maybe if a Blue component was made with EHG, the Pathans would show even higher admixure of it? And what is more correct? Isolating WHG as in K8 or making an EHG cluster instead? I guess it depends on what you are tracking (as in the case of using teal/West_Asian instead of isolating ANE). But assuming any European ancestry in South Asia is from EHG and not WHG, it might make sense to use such cluster to track that admixture in those populations. Hurrian has 45% clear cognates from an incomplet Swadesh list. Hurro-Urartian languages most probably descend from Kur-Arax culture (3700-2600BC) that was spread at his peak from Syria to Dagestan. Also some add Kassites also to Hurro-Urartian languages and perhaps some (not all ) Caucasic languages derive from Hurro-Urartic. My bet is that PIE is a some sort of synthesis from Steppe languages related to R1a and an language that was similar to Proto-Hurrian that came from South Caucasus-North Iran and even Turkmenistan. @Mike: My point was that I2a, as for example in modern Sardinians or Basques, or also in some ancient samples of EEF affinity (Treilles if I recall correctly) should be attributed to UHG (Balcanic Paleoeuropean) influence in the EEF genome. More specifically I'm thinking of I2a1-P27 (largely concentrated in the Adriatic Balcans) and the derived lineage I2a1a1-M26 (typical of Sardinians and some SW Europeans). Of course it could have been picked "on the march" in the area of Dalmatia (I used to think that) but we don't see any obvious signature of EEF admixture between Thessaly and final destinations (else LBK and Cardium samples should be more different), so it must have been incorporated already in Greece. David, do you suggest Andronovo should be Z-93 and Tarim Z-280? Give me the source please i'm working on the similar issue so it can be helpful!. @Chad: "The UHG is certainly not some late Balkan mix. These folks were present in the Near East for some time". I disagree. First, the Thessalian genesis is not a "late" thing but the very beginning of European Neolithic, implying some curious founder effects like E1b-V13 and G2a but apparently not other common West Asian lineages like J1, J2, other G, other E1b, etc. Second, the patrilineage I is well known to be almost exclusively a European lineage, strongly confirmed to be pre-Neolithic, so it must have been picked already in Europe. But finally and most importantly, the "Basal Eurasian" thing makes it nearly impossible that the origin of the West Asian element in EEFs is from Anatolia or elsewhere in Highland West Asia (Caucasus, Zagros...): it must be from Palestine! This fits well with the fact that there was still no Neolithic in Western Anatolia when the Thessalian Neolithic began, that later there was a stark difference between the Western Anatolian and Balcanic Neolithic and that a naval route via Cyprus is strongly suspected not just by me but also by archaeologists such as Koszlowski. "Also, I think the Magdalenian are going to be more unimportant than you think". Well, it is the Magdalenian what relates Lochsbour and La Braña, versus non-Magdalenian Motala and EHG. So it does seem to matter. How is this? Not sure but I would think that they all share common Aurignaco-Gravettian heritage but then evolved separately (at the very least this must be true for WHG and EHG, Motala may be some sort of mixture). Other separate branch was for sure in Italy but there should have been other isolated groups in the Balcans, be them related to Italy or not. What we do see is that they were not related with Eastern Europe because of the absence of ANE among them. Here are some stats to show that the LBK_EN_SW and Hun_EN(LBKT, K02, Starcevo) are pretty damn close to the original Levantine farmers, and that the hunter ancestry in EEF is almost all from there. See Spain_EN and Stuttgart are closer to Loschbour, as they have more WHG, and the blue component than the other farmers average. I think you can take those more basal EEFs, and throw in 8% SSA, and a pinch of this ENA, which I think Ust_Ishim shifted stuff/Crown Eurasian addition, and you basically have Bedouins. I think an older sample from Ukraine and just NW will change how we view Loschbour and KO1, versus LaBrana. I disagree with you on the difference between Anatolia and the Levant. I don't see a discontinuity in how their hunter ancestry shapes up. It wouldn't make sense for Levantines to be more Loschbour like, and Anatolia, closer to Europe, would be different... that doesn't make sense. I think the Eastern Med region was quite homogeneous. Some cultural differences don't equal genetic differences. I don't agree with you on the Bronze Age Hungarians. According to all analyses posted by Davidski BR1 has clearly more ANE than KO1. What's really particular about BR1 is the very low teal component. In the Haak et al. paper at K=16 and 17 BR1 has less teal than the two EHG. At K=18 and 19 BR1 has less teal than the Samara EHG. This might mean that BR1 had no West Asian admixture. But it doesn't mean she had no EHG admixture, or rather something inbetween EHG and WHG. Somewhere the increased ANE must have to have come from. And as for the Aegean, I think the largest deal of teal admixture arrived after the early Bronze Age and thus isn't covered by the samples in the Unterländer et al. study. By „special Uralic-PIE relationship“ I didn't want to imply a genetic relationship between the two language families, but just wanted to account for the similarities that even extend to basic vocabulary terms like water and to similarities in pronouns. If you assume that the direction of influence was mostly one way, from early IE into Uralic (don't know if that holds true), and if early IEs had been present on the steppe at a very early date, then it really wouldn't say anything about the origin of PIE. But we know that Anatolian split off from the remaining IE rather early, around 4400 BC according to Chang et al. Unless the PIE homeland was on the steppe, this would mean that IEs expanded to the steppe that early, otherwise they wouldn't have exerted a PIE-like influence on Uralic. What concerns Herodotus, I agree we can't be sure. But can it be true that he was wrong about Armenians, Phrygians and Etruscans? Possibly yes. He wrote that story of the Lydian origin of Etruscans was hawked by the Lydians. Perhaps the Lydians still knew what happened in their country a thousand years earlier, I wouldn't rule this out. Or perhaps they spread fairytales. The fact that the EEF are mostly captured by one component whereas the Yamnaya are made up of two components doesn't prove the homogenity of the former and the heterogenity of the latter, afaik. In fact David argues that the Yamnaya were already much homogenized. ADMIXTURE doesn't look for different blocks of ancestry in the genomes of individuals. Rather it explains the overall alleles of an individual as a mixture of hypothetical ancestral components, and if one of these components already explains the alleles of an individual very well, then no much admixture from further components is needed. But the hypothetical ancestral component may or may not be the result of a population mixture. The homogenity od dishomogenity of a population rather shows in similar or dissimilar ADMIXTURE results of the various individuals of that population. The Caucasus-Gedrosia / teal component in Greeks seems to be more from West Asia than from the steppe, and the (admittedly still limited) evidence so far seems to suggest that this arrived long after Vinca-Dimini. But the Caucasus-Gedrosia / teal West Asian component in Greeks is considerable, it's not a slight admixture. If IE Greeks came from the north, then this teal West Asian component must have been spread by a different ethnic group. Etruscan-related people would at least be a reasonable candidate. I've also considered the possibility that Pelasgian is a catch-up term into which the Greeks and Romans threw several distinct ethnic groups. But there's also the fact that Homer (in the 19th chapter of the Odyssey) explicitly distinguishes the Pelasgians from the Eteocretes, so I'm not sure if we can equate them. But it's interesting what you wrote about the Rakhmani culture. In Thessaly there was even in classical times an area called Pelasgiotis. And Dionysius of Halicarnassus wrote that the Pelasgians first went to Thessaly, then to Epirus, and then founded Spina on the lower Po. Also, according to Strabo Ravenna was founded by „Thessalians“. Till when calBC did this Rakhmani culture last? In the PCA plots posted by David the teal component doesn't quite look like a mix of ANE and ancient Near Easterners. It deviates from every straight line connecting ANE with West Asian populations. I'd say because it has drifted. The case of BR1 is strange and interesting. Are we sure the genome is not contaminated or very low quality? A Hungarian from 2000 BC that seems to be a mix of LBK_EN + Motala (or alternatively, Germany_MN + EHG). I think she had some 12% ANE (thought I didn't find her K8 figures), but doesn't trigger West Asian in K15 (so her ANE came directly from HGs). But strangely she has few East Euro too. David, did you ever try to model her with qpAdm? Could she be a link to a population that reached Iberia and be related to Basques??? The ethnicity of the Castellieri civilization is uncertain, although it was most likely of Pre-Indo-European stock, coming from the sea. The first castellieri were indeed built along the Istrian coasts and present the same Megalithic appearance characterizing in the Mycenaean civilization at the time. @ Simon In the PCA plots posted by David the teal component doesn't quite look like a mix of ANE and ancient Near Easterners. It deviates from every straight line connecting ANE with West Asian populations. I'd say because it has drifted. It could be drift post a mix of ANE and ancient Near Easterners, only from the FSTs it doesn't look like a component which has been subject to particularly heavy drift. It is no further or closer from the Sub-Saharan outgroup than EEF. I'd expect a population subject to strong drift to move away from the outgroup, although mixture could create a confounding effect. @ David EEF = farmers from the Fertile Crescent mixing with WHG-related hunter-gatherers in Anatolia and the Balkans. This is an interesting idea - OTOH though the EEF here is very present in North Africans (Moroccans, Tunis), who are the most EEF populations (including the ancients) corrected for their African admixture. AFAIK I would expect the North Africans are a case of a population founded by the Cardial Wave, so would expect Anatolia and still less the Balkans to be not too important for them. @Chad: "Spain_EN and Stuttgart are closer to Loschbour, as they have more WHG, and the blue component than the other farmers average". That's non-significant for all I know. EEFs cluster among them very well. There must be some minor individual/regional variability, of course, but focusing on that the way you're doing seems totally nit-picking. "... the hunter ancestry in EEF is almost all from [the Levant]". That makes zero sense. What defines HG in Lazaridis and Haak and all this discussion is precisely their Paleo-Europeanness. What kind of logic brings you to claim that there were Paleo-Europeans in Palestine in the Neolithic? The most parsimonious logic suggests that the HG element is from the Balcans. Davidski said Anatolia or Balcans but I have already mentioned the reasons why I doubt Anatolia is relevant either in the West Asian or in the Paleo-European (HG) direction. So Balcanic and more precisely: Paleo-Greek. Afterwards they may have picked minor WHG elements, as you suggest for Stuttgart and Spanish ENs but that's not in the EEF core: the orange component. "I disagree with you on the difference between Anatolia and the Levant. I don't see a discontinuity in how their hunter ancestry shapes up". We cannot see much because so far we don't have ancient samples from that area save for a handful of mtDNA sequences from the PPNB of the Syrian Euphrates. But, based on modern DNA, Highland and Lowland West Asia (North and South if you wish) are very different in autosomal and Y-DNA patterns (at least). This surely reflects ancient differential populations, one centered around the Zagros and the other around Palestine. We see that bipolarity in the Paleolithic and later also in the Neolithic. They overlap, of course, mostly in Syria-Lebanon and in Iraq, but they are still different. I never claimed that. The West Asian element in EEF is NOT Lochsbour-like. Only the Paleo-Balcanic (UHG) element in it is. "I think the Eastern Med region was quite homogeneous". There were at least two regions (we can see that in archaeology and genetics) but as far as I can discern neither was much closer to Paleo-Europeans than the other. It's possible that there was some minor inroads of Paleo-Europeans in SW Turkey but it's also likely that had nothing to do with the EEF genesis, it's also likely (almost certain) that there were Paleo-European influences in North Africa (surely reaching as far east as Egypt) but probably did not have significant influence in the EEF genesis either. The UHG element is something aboriginal European, and almost 100% certain from Greece.
" So Balcanic and more precisely: Paleo-Greek. " "EF affinity (Treilles if I recall correctly) should be attributed to UHG (Balcanic Paleoeuropean) influence in the EEF genome. More specifically I'm thinking of I2a1-P27 (largely concentrated in the Adriatic Balcans) and the derived lineage I2a1a1-M26 (typical of Sardinians and some SW Europeans). Of course it could have been picked "on the march" in the area of Dalmatia (I used to think that) but we don't see any obvious signature of EEF admixture between Thessaly and final destinations (else LBK and Cardium samples should be more different), so it must have been incorporated already in Greece"
Yes, I know P37.2. But P37.2 - even M423 - has already been found. Labschour and Motala are 423 +ve (!) They're WHG ! M26 is Neolithic Treilles and the Paris Dolmen are in a clearly Neolithic context - taggers-along in a company of otherwise predominantly G2a.
" so it (I2a) must have been incorporated already in Greece"
Impossible, on the basis of the rather convincing aDNA evidence we have, and above explanations. "This fits well with the fact that there was still no Neolithic in Western Anatolia when the Thessalian Neolithic began, that later there was a stark difference between the Western Anatolian and Balcanic Neolithic "
You might be right, but it might be related to state of research, lack of finds due to extensive alluvial deposits, etc. But, sure, the current state of knowledge implies little in the way of EN in west Anatolia, suggesting a sea bronze route. I don;t know. @Simon: "Till when calBC did this Rakhmani culture last?" I don't know for sure right now because it's difficult to find references online on such "obscure" themes (there are books online mentioning Rakhmani, but didn't feel like searching them for an answer I already know in the rough terms). For what I know Rakhmani succeeds Dimini (it is Dimini with a different name and some Trojan influence) at the end of what used to be called the Chalcolithic, so it basically continues all the way in the Early Helladic. The transition to IE Greece happened between the beginning of the Middle Helladic (c. 2000 BCE, when tumuli appear in Northern Greece) and the beginning of the Late Helladic (c. 1500 BCE, when we already find Mycenaean Greece in its splendor). I must say that I do find very much credible the piling up of all those traditions about Etruscans and "Thessalians" going to Italy that you mention. Add to them the Roman legend of Aeneas, allegedly the founder of Alba Longa and Latium itself but very likely a borrowing from Etruscan traditions (as so many other things "Roman"). "I don't agree with you on the Bronze Age Hungarians. According to all analyses posted by Davidski BR1 has clearly more ANE than KO1. What's really particular about BR1 is the very low teal component. In the Haak et al. paper at K=16 and 17 BR1 has less teal than the two EHG. At K=18 and 19 BR1 has less teal than the Samara EHG. This might mean that BR1 had no West Asian admixture. But it doesn't mean she had no EHG admixture, or rather something inbetween EHG and WHG. " SImon, the numbers dont lie. Neither BR1 nor BR2 had west asian. This "EHG" signature you're seeing is admixed eastern WHG. Model it yourself - see what happens when you fuse CO1 + K01 ; you get the BRs. "And as for the Aegean, I think the largest deal of teal admixture arrived after the early Bronze Age and thus isn't covered by the samples in the Unterländer et al. study." Well, the samples reached into the third millenium. So Im not sure you're correct there, either. Also consider the very Sardinian looking BUlgarian Iron Age samples (admittedly low resolution). Looks like the Teal people arc around the north of the Carpathians ! This conclusion is incontrovertible, on the basis of (admittedly small n) present evidence. "We know that Anatolian split off rather early, around 4400 BC according to Chang et al"
No we don't ""know"" this. I disregard waftamy "equations" and calculations. Language change - human behaviour- cannot be reduced to mathematics. Yes, it might be oldest, but Anatolian is not actually *that* deviant. When one considers substratum effects - given the multilinguality of Anatolia- then there is nothing too unusual or too too old about Anatolia. - Which you must remember is actually 4 or 5 rather different languages. Hittie is the most 'deviant'. The others are very much plain IE. "What concerns Herodotus, I "
He's called the father of lies, Simon. Not because he intended to deceive, but he 'invented' to entertain. Any Anglo-American historian would cringe at the thought of people using ideas of "Pelasgians" to reconstruct deep prehistory. An invented people used as an origo gentis for the Athenians during the 6th and 5th century political arena of Greek poleis - to "prove" their autochthonicity and thus prestigious antiquity. .
@Mike: "If so , this must be E- V!3.. It can;t be I2...."
Why not? I2 is part of the genetic pool of modern Greeks and it is a lineage that we know for sure that was common in Epipaleolithic Europe (various populations). I has frequencies today between 10 and 24% in mainland Greece, and surely almost all of it is I2. One of the highest frequency sites is precisely Franchthi (21%). Thessaly has ~14%. In any case, we know that I2 is paleo-European, while E1b is clearly a migrant from NE Africa via the Levant, so the logical conclusion is that E1b (along with G2a and maybe also J2/J1) arrived with Neolithic to Greece. I2a1 is clearly involved in the Cardium Pottery colonization (Adriatic Balcans possibly, Sardinia and finally the Pyrenees). "Labschour and Motala are 423 +ve (!)" M423? I don't understand your notation. What are we looking for? Paleo-european lineages picked up by EEF before splitting into two segregated colonization waves (continental and maritime). E1b shouldn't be that but I2a1a1 fits perfectly! "M26 is Neolithic Treilles and the Paris Dolmen are in a clearly Neolithic context - taggers-along in a company of otherwise predominantly G2a". Exactly my point: Neolithic! M26 is unrelated to Lochsbour but it is related to West Balcanic I2a1. Here are the Y DNA results from Haak 2015. A Motala HG had a derived clade of I2a1-M26. I2a1b-M423 existed in the Neolithic, and has been found in the Mesolithic. Y DNA I itself can confidently be placed with WHGs, UHGs. "EEF = farmers from the Fertile Crescent mixing with WHG-related hunter-gatherers in Anatolia and the Balkans"
I think it's more complex. At least StarcevoStutgart etc must be a three way mix; WHG + Levantine + "x"
@Mike: "Any Anglo-American historian would cringe at the thought of people using ideas of "Pelasgians" to reconstruct deep prehistory". It's just an ideological argument the one you are making, quite arrogantly by the way. The use of the term "Anglo-American historian" made me giggle, honestly. As continental European, the notion of "Anglosaxon" approach to science, particularly history and prehistory, normally conveys shiverings of self-aggrandizing hyperbole looking for the media limelight, as well as confusing terminology like calling "Late Neolithic" to the "Chalcolithic". Sadly the influence is spreading. But regardless, Anglosaxon or not, a lot of people simply prefers to speculate about the extremely conjectural motivations of ancient scholars like Estrabo, Herodotus or Plato when they are describing what they convey as historical reality, There's only one reason for that: they believe different things and prefer to disqualify the source, so they can hold to their wishful thinking. They could be confused, of course, but IMO they were transmitting seriously what they believed to be historical facts as told to them. Also oral traditions are often more serious than we tend to give credit for: in a time without writing, narration was important. Many people didn't believe Troy existed either, but it's there. Pelasgian is of course a confusing term, and was surely a catch-all term already in Ancient Greece. We should use it that way for caution but catch-all or simple, the concept is still valid to describe pre-IE Aegean peoples such as the Rakhmani culture which came under discussion. I appreciate your knowledge of Neolithic Europe, but you're a little behind the 8 ball when it comes to Hg I2. "Why not? I2 is part of the genetic pool of modern Greeks and it is a lineage that we know for sure that was common in Epipaleolithic Europe (various populations). " " we know that I2 is paleo-European, "
"I2a1 is clearly involved in the Cardium Pottery colonization"
Not likely. I2a isn;t a Mediteranean basin marker. "Labschour and Motala are 423 +ve (!)" M423? I don't understand your notation." "Neolithic! M26 is unrelated to Lochsbour but it is related to West Balcanic I2a1." Yes, M26 is different to Labschur. But Labschur is M423, just like modern Balkanic. M26 is a 'distant cousin clade' which split c .LGM. So your "Balkanic" I2 cant be "X" - it is pure WHG. @Krefter: Alright. How do you explain it ended up in Sardinia then? "Y DNA I itself can confidently be placed with WHGs, UHGs". And what am I saying? UHG lineage picked by EEF. Treilles are EEF, but are (partly) also I2a. There were probably people from Balkans-Ireland who had I2a1-P37. It totally makes sense Sardinians have M26. They probably got it from WHG people, I would guess west of Greece. Also there may have been a recent founder effect of M26 in Sardinia which caused it to be so popular. The ''teal'' component looks like it could be associated at least in some areas/ways with Y-DNA haplogroup J2a. Of course the correlation between autosomal DNA components and Y-DNA and mtDNA haplogroups is never really 100%. If you actually think that roman writers from the turn of the common era were making accurate ethnographic statements about phenomena which happened hundreds to thousands of years before. Doubting ancient historians isn't an Anglo-Saxon conspiracy- it is called contextual source criticism; and something one learns in history 101. If you don't know those then you really are uninformed . I'm guessing this must be an Upper Paleolithic genome from the Near East or Central Asia. Europe is less likely, but also possible. You obviously didn't pay attention to the Dstats I posted. UHG is a lot like Loschbour. 1. EEF and modern Levantines have basically the same preference for Loschbour over Karelia. 2. Good amounts of EEF orange in Africa and Levantines. This goes against something more basal to the south, creating EEF in Greece. It doesn't match at all!!! Over and over, you ridicule what I say, but it is you that ends up being wrong. Someday, maybe you will take my words seriously. You stated earlier that you think that EEF is WHG + Levantine. I don't see it being such a mixture. I think, at best, WHG is 25% in some samples (eg Hungarian LBK). Chad, do you think Basal Eurasian in EEF has anything to do with Africans? What I mean, does it show more relation to Africans than mainstream-Eurasians do? This is the source of that quote. P.S. BTW the Herodotus claim about Armenians is not correct. I answered this issue in Maciamo's forum. But his error was perhaps not deliberate but from misunderstanding of some near eastern sources. This is a very common in ancient history. For example Kassites were called Ethopians etc. Because their names sounded similar. "What kind of logic brings you to claim that there were Paleo-Europeans in Palestine in the Neolithic?" What if there were two groups of Paleo-Europeans - a more coastal distributed group all round the Med. and Atlantic coasts (WHG) and a more inland (or higher altitude) one? If so then might EEF have developed out of WHG in the Levant and thus Thessaly more to do with the second group of farmers or a merger of the two: EEF coming to the Aegean by seas and the other by land? Please examine the ADMIXTURE figure from Haak at K=11 carefully for the beige component. This component is found only in the Onge, South Asian populations, Cambodians, Thai and Australians. It is clearly related to ASI. The association of this ENA component with MA1 suggests that MA1 originated not in Central Asia but in the Indian Subcontinent. The Mediterranean, because of its rugged geography, did not show much more land than today in the Ice Age. The main exception is the Adriatic Sea, half of which was emerged land, but otherwise the changes are minor. Cyprus was an island, Crete was an island, Sicily was an island, Corsica-Sardinia were joined but still an island, the Cyclades were a larger landmass but still an island, etc., and sea distances in general were almost as large as today. Also there are no obvious indication of long distance navigation in the Mediterranean or elsewhere in West Eurasia before the Neolithic or at the very least the Mesolithic (first arrival to Cyprus notably). "It is 12 kya old according to full Y sequencing". Even if that would be correct, it first evolved in the Levant for all I know, from precursors present in that area and Egypt/Sudan. The pattern of expansion fits clearly with the expectations for Neolithic: (1) the Palestinian Meso-Neolithic developments, with Egyptian Mesolithic influences that are surely the "Basal Eurasian" thing of Lazaridis, still notorious in that area, (2) the European Neolithic genesis in Thessaly (very possibly through coastal migration via Cyprus), (3) the European Neolithic expansion patterns and the archaeo-genetic confirmation in a Neolithic farmer from Catalonia, (4) the excellent fitting with the African-like notion of "Basal Eurasian" component (as strong as 30%) in EEFs, being the only lineage that did not go through the mainline Asian evolution and distribution process. I appeal to Occam's Razor. If you did that, you would include the Dstats and admixture runs in your analysis. Instead, you assume you're correct. So, I think you're in no position to make that appeal. Once again, you'll be wrong. Yet, it won't stop you from jumping to insults the next time I disagree with you. "If you actually think that roman writers from the turn of the common era were making accurate ethnographic statements about phenomena which happened hundreds to thousands of years before; then you really are uninformed". Is not that I am "uninformed", is that I give them a bit more credit than you do, after all they were the scholars of their age and must have got a genuine interest in compiling information. Another issue is whether that information was misleading or not. Many written sources have been lost, including the once admired Library of Alexandria (Egyptians could keep a better written record than others because of relative continuity of their culture and polity but others also seem to have kept some memories that do make sense). In times of Herodotus (5th century BCE), Lydia only had 800 years and the presumed Etruscan migration 900, not more than separates us from the Romans, of which we keep strong memories, or the Muslims from Mohamed, who is believed to be reasonably well documented (even some early Christian or ancient Jewish texts seem very much historical, once we peel off the religious layer). We keep some Medieval epics from events comparatively older like Roland's death or the Cid's conquest of Valencia. We know that much less credible sources (Homer) happened to be right in the essentials and we know that some of the stuff that Herodotus documents is very real (Lemnian dialect). I think that Herodtus must be considered "plausible" and a best source among those available. Of course other evidence such as linguistics (Lemnian) or genetics (apparent extra tendency towards the Eastern Mediterranean of Tuscans and ancient Etruscan DNA) are also to be considered (and they seem to fit). But on their own right, the fact that one after another, a lot of different legends pile up in favor of "Pelasgian" migrations/conquests in Italy should at least be taken as, not quite evidence but certainly a very suggestive track to follow. You sound like a cartoonish white man explorer or hunter in Africa being told by the native guide: "the track is fresh, the lion is right there", and you say: "nah, natives are liars, I see no lion". Famous last words, I guess. Yes I see your points; E-V13 is most likely neolithic; and its "geostructure" is all too self evident . So are you suggesting that E-V13 is a haploid equivalent of the "basal eurasian" of the Levantine neolithic ? It's not my intention. But it seems you do not explain yourself well enough. So when you say "orange is Lochsbour", I must state the obvious: it is not, Lochsbour is blue. Why would you say "orange is Lochsbour"? Beats me honestly. Is UHG Lochsbour-like? I don't know how much or more exactly: how much of that is driven by ANE admixture in EHG/SHG, something that was obviously not in UHG. "Someday, maybe you will take my words seriously". Try explaining things properly: it's not about you or me, it's about what's going on in the data, right? About the primary ancient sources -what Herodotus wrote is what was in political fashion during his time; and his "histories" were part of a broader debate with his colleagues. He can't be recalling events from 500 years ago- because there was no history recorded back then; in fact it was the peak of the "dark ages". Migration myths and sick were popular topoi used to explain phenomena and propagated by elite to justify their rule. He also invoked word play to generate histories - most famously - the Brygi- Phrygoi story. @Grey: EEF and WHG are for our purposes considered opposite (even if EEF seems to have some WHG-like UHG admixture). So I do not understand the meaning of trying to attribute WHG origins to EEF, at least to the Asian part of it. It's clearly something else, something specifically West Asian (and probably also to some extent African). For all we know (Lazaridis particularly), there was an ancient West Eurasian metapopulation including ANE, WHG+ and West Asian. ANE is the first to branch out, then WHG+ (Paleo-Europeans) and West Asian diverge. EEF is basically West Asian with some admixture ("Basal Eurasian" and UHG). Thank You Very Much Aram. Krefter: Chad, do you think Basal Eurasian in EEF has anything to do with Africans? What I mean, does it show more relation to Africans than mainstream-Eurasians do? Not Chad, but by FSTs it does seem like Basal Eurasians influenced populations like Stuttgart are closer to Africans than non-Basal Eurasian ones. At the same time, so as East Asians relative to Native Americans, who seem to be heavily drifted. So it's hard to tell if that closer to African effect is Basal Eurasian having some African to them vs just having less drift overall. Generally, I don't have any objection to the idea that Basal Eurasian had an African origin - it's as plausible candidate for a homeland for these people, if they existed, as any of the other nearby places. But I would point out again that Basal Eurasian admixture into EEF has very different qualities from what recent African admixture would have. Recent African admixture, like the Basal Eurasian, pushes a group away from WHG and ENA. The difference with recent African admixture is that it, for a given quantity of "push" away from WHG and ENA, it makes a group much closer to recent Africans. As per Laziridis's models, Basal Eurasian doesn't do this, near as much. BE mainly "just" pushes away from WHG and ENA, without pushing a group much closer to Africans. BE makes you much more distant from ENA and WHG relative to how close you are to Africans. That's why recent African admixture vs Basal Eurasian admixture need to be modeled differently. A WHG group with enough recent African admixture to be as distant from East Asians as LBK are would be much closer to Africans than LBK are. AFAIK this is also the case for Dinka, although they do behave relatively close to the African->non-African bottleneck (on the basis of a lack of EEF like admixture). So in BE was African, it is not a kind of African which really survives in Africa today independently from EEF. AFAIK from Davidski's f3 stats, all Africans who are closer to EEF than other Eurasians are also closer to Loschbour than other Eurasians, so must have an EEF like admixture, and Loschbour affinity is in a strict ratio to Stuttgart affinity, suggesting no role for additional BE admixture. This does not rule out BE living in Africa of course. Interesting idea, I hadn't considered it. It seems possible if these people migrated through Northern Italy and southern France, thereby avoiding the Corded Ware influence in Southern Germany. Bergamo has only slightly less EHG-like admixture than Spain. But on the other hand the EHG influence in Bergamo is better modeled as coming from LNBA people. Afaik Cardium pottery in Northern Africa has only been found in Morocco and northwestern Algeria, but not in Tunisia. Thanks for the info re: Rakhmani. But I have to correct you about the West Asianness of the Tuscans. As I've said before, in the Italian context, Tuscans are not particularly West Asian. Below average, I'd say. The strongest West Asian influence is in Southern Italy and Sicily, especially Eastern Sicily. It seems the Greeks proper had spread more of it than the ancestors of the Etruscans. The pre-Venetic people of Venetia were the Euganei. Unfortunately not much more is known about them apart from their name... There was also the ancient belief that the Veneti themselves were from Paphlagonia in northern Anatolia, as a population of similar name fought on the side of the Trojans, according to Homer. Whatever the truth in this may be, their language was undoubtedly close to central European Celtic, Germanic and other Italic languages and therefore cannot have been from Anatolia. Careful, BR1 and BR2 don't have the Eurogenes K15 West Asian, that's right. But BR2 has 10.1% Dodecad K7b West Asian and 1.14% Dodecad K12b Gedrosia. The results of one single calculator shouldn't be made into an absolute. In Eurogenes K15 this West Asian affinity shows itself as an increase in East Med and Red Sea. As far as BR1 is concerned, all calculators from genome bloggers give it 0% West Asian-like components. But still it's possible that she had some low level West Asian admixture. Because 0% of an ADMIXTURE component doesn't prove the absence of such an admixture, it may be just a local minimum. And indeed, in the Haak et al. run, she does have a little bit of teal. Whether that's from West Asia of from EHG cannot be determined. No, KO1 doesn't suffice to create BR1 because he doesn't have enough ANE. You have to take into account that BR1 is about 50% EEF with no ANE, while KO1 is nearly pure HG. And check the PCA in Haak et al. You don't get anywhere near the BRs if you connect CO1 with KO1. Regarding your question how we can get Yamnaya into Hungary without West Asian: Perhaps it's rather acculturated, „Yamnayized“ Usatovo and Cernavoda. But note that apparently Yamnaya wasn't homogenous in its West Asian admixture, apparently in Khvalynsk they had half the Armenian-like admixture they had in Samara. As for Unterländer et al., I'd say we need Greek samples from the end of the third millenium. The „Sardinian-like“ Bulgarian had 16.67% West Asian in Eurogenes K15. Anatolian IE might not be the oldest branch, it definitely is the oldest branch, according to all linguists. I don't say that it's too old or in anyway unusual. But the Chang et al. estimate is even a relatively young date, according to Gray, Atkinson and Bouckaert it split off around 6200 BC. Of course maybe it's all rubbish and it split off 3200 BC or later. But your suggestion that only Hittite is deviant and the others plain IE is outlandish. We are talking here of the Anatolian family of IE. These languages are much closer to each other than to any other IE language. Mind you, the Anatolian branch doesn't include Phrygian and Armenian. And as for your complete dismissal of ancient authors' opinions regarding the origins of peoples: Imho it's better to take all available evidence into consideration than to completely reject one category of evidence a priori. Of course with a big grain of salt! I'm not suggesting to consider all these stories blindly as true. But we have to take note of them, and to remember them in every case where other evidence suggests that there may be some truth in them. Also please note that not only Herodotus wrote about Pelasgians, but also Thucydides who is regarded as much more reliable by present-day historians. Your explanation that the Greeks invented the Pelasgians in order to regard themselves as autochthonous, that's a very questionable motive. They might just as well have regarded the Greeks as autochthonous. Why make it unnecessarily complicated? Anglo-American historians seem to prefer the evidence from archeology. I remember one of them writing about the origin of Etruscans. He declared that there was continuity between the Bronze Age and the Iron Age: a slow change from incineration to inhumation and settlement continuity. And from this he concluded that the Etruscans developped locally from the Bronze Age. But such reasoning can easily be shown to be delusory: In Bisenzio (in northern Latium) there was settlement continuity from the Bronze Age to the Middle Ages! Yet quite obviously there must have occured language replacement there. You need to read more carefully. I said the orange is mostly Loschbour like. UHG is like WHG. Maybe even hyper WHG. Even west Asians with EHG still prefer Loschbour about as much as the first farmers. Bedouins and a couple others are pretty much equal with EEFs preference WHG. I can promise you, I will be correct on first farmers from the northern levant. Orange is a major component of west Asians for a reason. The blue is Motala like, as it's a mix of WHG and EHG. So is it safe to say then that the blue component from this K9 test is a true European Mesolithic hunter-gatherer component? I understand that's because they all share the absence of ANE, that's why. You call it "Lochsbour" but I call it "generic West Eurasian without ANE" and I think it's much much more correct. Maju, all west Asians except Bedouins have ANE. Only Southwest Asians have less than the average European. The rest have more on average than Europeans. This is of course assuming the current model is correct. Is rather surprising because Iraqi Jews do have a good 12% ANE, so in theory they should be closer to Karelia_HG. EEF were a mix of Atlantic_Med and Caucasus (and by Fst distances, Atlantic_Med is closer to Caucasus than to North_European). So it makes sense that Loschbour is closer to Near Easterners (even counting that modern NEs have some ANE that mitigates the difference). I take your points on the genetics themes. 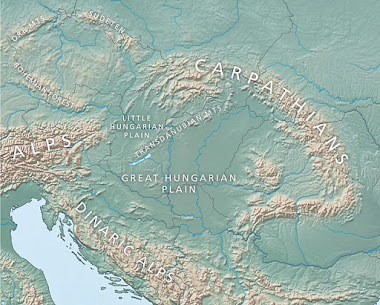 The Carpathian basin was a mosaic in the late Neolithic - early bronze eras. I'm sure people will be now specifically trying to sample the occupants of kurhans in the Eastern aspect of the Carpathian basin; where one would expect to find most evidence ""Yamnayization". What do you think these finding of consistent Labschour affinities suggest ? I believe that a Kotenski like UP population spread the North European K12b component to EHG,WHG, and SHG. It doesn't make sense that EHG and WHG would share so much without coming into contact with eachother. The West Med K12b is probably the original WHG/SHG component and the Gedrosia like South Asian component the original EHG/MA1 component. Anatolia might have been populated by Loschbour-like hunter-gatherers prior to the Neolithic transition. Early European Farmers (EEF) might well be Early Anatolian Farmers (EAF) and the result of admixture between local foragers and mostly Basal Eurasian (Natufian?) farmers from the south. Of course we've already seen mtDNA from Mesolithic southern Greece, and it looks Near Eastern. But those results have only appeared once in a slide show, and since then might have been thrown out for whatever reason, like contamination. The other option is that the southern Greek Mesolithic population island hopped north from the Levant and bypassed Anatolia. "EEF and WHG are for our purposes considered opposite"
Yes and I wonder if that initial framing may have skewed thinking since. If there were in fact two first farmer groups: a more maritime E population out of the Levant and a more overland (G?) population from somewhere else with the two groups eventually merging in most (but not all) places thus leading to the idea there was a a single EEF instead of two. Things like the "Pelasgians" would fit neatly into place if there were two farmer waves with the first one mostly (but not completely) being overlaid by the second. The fit would be even neater if the first wave was more maritime. Regarding ancient writers and things like Pelasgians. I think there's a distinction between the plausibility of singular events in their distant past and events which were still had ripples into their recent past. An example of the first might be an island with Pelasgian colonies speaking Pelasgian languages which gets conquered and wiped out by someone else in the distant past. An example of the second might be an island with Pelasgian colonies speaking Pelasgian languages which gets mostly swamped by a larger second wave of *separate* colonies speaking different languages and hundreds of years later the descendants of the former are still speaking versions of their original language or a heavily inflected dialect of the new dominant language. "(even if EEF seems to have some WHG-like UHG admixture). So I do not understand the meaning of trying to attribute WHG origins to EEF"
There are only a limited number of logical options. 1) The Levant farmers must have derived from HGs. 2) Those HGs must have had a range. 3) The current idea is the Levant farmers were a mix of Basal Eurasian (BE) and WHG. So there are only three options. 1) There were BE HGs in the Levant and *only* the Levant. BE farmers derived from these BE HGs and then spread into territory that was wholly WHG. 2) There were BE HGs both in the Levant and *beyond* the Levant. BE farmers derived from the BE HGs in the Levant and then spread into territory that was a mixture of BE HGs and WHG. 3) The Levant farmers were derived from WHG. So given the initial premises the choice is either 1) BE only existed in the Levant, 2) Basal Eurasian HG populations existed outside of the Levant also or 3) the Levant farmers were derived from WHG. the original study is interesting also for the analysis of suffixes which can be similar. with the ''ancient Neolithic'' substrate or the Bell beaker people. Relating to Central Asian-rich ANE people who may have contributed to Yamna, and H in Pre-Neolithic Europe. I think most have forgotten about the loads of Ancient DNA from the Barbara Steppe. Besides East Asian lineages all had U5, U4, and U2e, till Andronovo came and brought typical Near eastern lineages. So, the new CRS(supposed H)-with some extra mutations from Russian hunter gatherers are surprising. It doesn't seem likely EHG and ANE were H-rich. Also, if non-EHG and ANE-rich people from Central Asia one way or another contributed to Yamna there's a good chance they brought similar mtDNA as EHG. So, contributed to the high U5, U4, and U2e in Yamna. Andronovo came from Yamnaya, so we should expect Yamnaya-like mtDNA among the Andronovo groups of the Baraba steppe. Yes please do share the David Anthony link by email. Thanks! Good to know! I will be waiting for updates in your blog. I will be following closely..
“ENF is hiding under the Yemenite Jews”. Interesting.. If I am not mistaken, the East_Med component peaks among Yemenite Jews in your k15 and k13 calculators. Maybe early Levantine farmers were something close to 100% ‘East_Med’? The most propable culture that can be associated with Hurrians is the Kura-Arax culture. Kur-Arax was a new layer on top of old Neolithic culture Shulaver-Shomu. Shulaver-Shomu can be associated with Catal Hoyuk but Kur-Arax was a different phenomena. Kur-Arax is the contemporary of Maykop. By the way David, would you mind sharing some more info on your Cypriot and Greek samples? I have noticed that you have included new Cypriot samples in addition to the usual 11 from the Behar study. Are these people who participated in your crowdfunding K8 initiative? Also, I have noticed a very 'strange' Greek sample (NA17374), with exceptionally high (for a Greek) 'Central_Asian_teal' admixture and exceptionally low 'European_blue' admixture. I am pretty sure this person is of Pontic Greek ancestry. Could you please confirm? Thanks! I've just sent you the e-mail. These new Cypriot and Greek samples are from the Human Origins dataset. I don't know much about them, but I'm pretty sure Iosif Lazaridis can tell you where they're from exactly. Aram, Kura-Araxes can be attributed with the Fusion of locals with Incoming Indo-Europeans IMO. firstly the west-asian in eastern Sicily is from the Phoenicians/Carthaginians and Anatolian "Greeks". Corinthian Greeks only settles in the western part of Sicily. On the culture I present , it stated megalithic, the venetics as per archaeology where only there from 1150BC, the Euganei with their 34 towns as stated by cato, where too numerous for the veneti from anatolia to conquer, the veneti absorbed them piecmeal into venetic society. Also the venetic did not bring a language the absorbed the central-european ( similar to rhaetic and camunic language that the Euganei spoke. Whatever the veneti from anatolia spoke, it was not taken to Italy. Natgeno already confirmed in 2005 and again in 2010 that the "proper" veneti where from Anatolia via the 100% matching indicators used. they also found no link with either the Brittany veneti or the Baltic venedi. - Kostenki who was a kind of proto-WHG had Near Eastern affinity (it shows a significant amount of orange is the admixture from Haak et al. ), while MA-1 lacks it (and MA-1 could be a kind of proto-EHG). But n=1 of each is not very conclusive. - WHG were mostly haplogroup I, but when they entered Europe they were probably IJ. Near Easterners are predominantly J, so also they come from IJ. Maybe some shared common origin (though the split happened some 25.000-30.000 ya, and Kostenki or La-Brana were both C, so who knows if that has any meaning at all). - Gene flow during the UP between Anatolia and the Balkans. They were connected by land, so there must have been gene flow of some sort. Maybe even some gene flow also between NW Africa and Iberia in those times. @Krefter: having or not having ANE is relative to the comparison (it's a measure of affinity relative to the affinity to some other reference). Even Sardinians were said to be 4% ANE in Lazaridis. I was surely using the term wrongly by wanting to emphasized a logic-port (0/1, yes/no) qualitiy of the issue, much in the way Davidski uses it at times. West Asians have very little ANE when compared to Europeans, they are near the Sardinian extreme. So "no ANE" for the digital yes/no logic. What makes you think most West Asians are comparable to the HGDP Sardinians in terms of ANE affinity? If that were true, then how do you explain the structure of West Eurasian PCA, with fer few West Asians plotting as far west as Sardinians? What in your opinion makes them more eastern if not ANE, and why are the most eastern West Asians the Lezgins, who happen to have the highest ANE affinity in West Asia? @Alberto: the figure you provide is so close to zero that I'd read neutrality, no significant affinity for either. Test with more populations, preferably ones that are not hyper-endogamous extremes. Personally I wouldn't use any Jews, Druze or even Finns or Icelandic... unless I strictly need to: too peculiarly drifted because of long term endogamy. Yes. That indicates their affinity to modern populations. Interpreting is more complicated because our ancestors are definitely not our descendants, so something is fundamentally wrong in analyzing old samples in term of modern populations. In the case of Siberian affinity in EHG it may well be because of ANE admixture in EHG (but the 12% figure does not represent it properly at all) but what with the Gedrosian or Atlantic-Med pseudo-components? They may mean ancestry of the modern populations affected by those components for example (Atlantic-Med may well just mean extra WHG ancestry in West Europe for instance unless you have some odd reason to imagine a real ghost AM population that was ancestral to Lochsbour, what I do not). A. Archaeological data: (1) Thessaly first in all the Aegean (and by extension Europe), (2) no Neolithic in West Anatolia until many centuries later, (3) a sharp divide between West Anatolia and Balcan Neolithic when the former finally forms. B. Genetic data even: (1) clearly at least two distinct populations in West Asia (both autosomes- and Y-DNA-wise), one centered around the Zagros and the other around Palestine (again consistent with archaeology), (2) clear affinity of the EEF (Thessalian-derived Neo-Europeans) with the Palestinian rather than with the Zagros-Taurus-Caucasus core, (3) clear affinity of the West Asian component in Yamna with the Zagros component instead. @Grey said: "If there were in fact two first farmer groups: a more maritime E population out of the Levant and a more overland (G?) population from somewhere else with the two groups eventually merging in most (but not all) places thus leading to the idea there was a a single EEF instead of two". What's the EVIDENCE behind this wild speculation? What we know is exactly the opposite: common origin in Greece, followed by segregate patterns of spread in the Mediterranean and Continental routes, yet still remaining essentially the same in terms genetic (so very limited extra admixture). "1) The Levant farmers must have derived from HGs". Of course, local HGs (who are well documented in terms archaeological and have no relation whatsoever with those of Europe that we can pinpoint after the early UP). The concept of "HG" as generic "hunter-gatherer" is fundamentally different from the ad-hoc "HG" as "European pre-Neolithic aborigines", let's not confuse things, please. Lazaridis and Haak use the concept "HG" meaning European HGs, never West Asian ones. These are implied to be ancestral to Neolithic West Asian and by extension EEFs and the West Asian component in Yamna (whose differences suggest a lot about a structure in West Asia in the early Holocene similar to what we see today - awaiting direct aDNA confirmation, of course). "2) Those HGs must have had a range." Naturally, but nothing to do with Europe: their range was the Levant and then also influences from Egypt in the Mesolithic (which are surely at the origin of the "Basal Eurasian" thingy, as well as the Y-DNA E1b spread in that area and later in Europe). "3) The current idea is the Levant farmers were a mix of Basal Eurasian (BE) and WHG". NO! That's a gross misinterpretation of Lazaridis' reconstructions. The actual mix is: Paleo-Near-East + "Basal Eurasian" (African-like) + Paleo-European (UHG). There's always this core Paleo-Near-East component that they call I believe "NE", which is distant sibling of "HG" (Paleo-European) and distant cousin (both) of "ANE" (Paleo-Siberian). All them hang ultimately from the mainline Eurasian major branch of Humankind and that makes them different to the so-called "Basal Eurasian" which is comparatively African-like (but not Pygmy-related). @Mike: the only known "mtDNA from Mesolithic southern Greece" is from Franchthi cave (Argolid) and it's borderline Meso-Neolithic. It is H.
It's the same paper that found mtDNA H in Linatzeta (Epipaleolithic Basque Country). The Franchthi and Linatzeta sequences are identical for the markers tested (so rather not "Near Eastern"). @Krefter: Barabba (not "Barbara"). It's not "steppe" either but taiga. IMO those peoples were all the time (proto-)Uralic, except maybe in the Ust-Tartas period (part of the early Siberian Bronze Age), when they got a quite apparent wave of Tungusian-like haplogroups. It is true anyhow that Andronovo influences are related to the arrival of more European lineages, including those of West Asian origin, so good point, yes. @Alexandros: The problem is that Yemeni Jews have nothing to do with Levant Peoples because they are a subset of Yemenis genetically speaking. The main difference is that they seem to have less African influence than other Yemenis but this is a minor trait. Historically they descend from the time when Yemen was a Jewish state (from c. 300 CE until conquest by Mohammed). So when someone mentions Yemeni Jews they mean Yemenis in general, not Levant peoples. @Davidski: "What makes you think most West Asians are comparable to the HGDP Sardinians in terms of ANE affinity?" THIS! (from Raghavan 2013, the original Mal'ta boy paper). "If that were true, then how you explain the structure of West Eurasian PCA, with fer few West Asians plotting as far west as Sardinians?" I'm not sure which "few West Asians" you mean? Normally I see Sardinians on their own and quite at a distance from any West Asians, so totally perplex about your claim/question. PCAs are oversimplifications. You know from your own ADMIXTURE runs that ANE is low in West Asians, even those who have it at greater frequencies, nothing comparable to what is seen in NE Europe or even NW South Asia, North Caucasus peoples may be partial exceptions but they are border area peoples (look at Kurds, Turks or Iranians instead). IMO the PCA is structured mostly around modern differences - so yes: Lezgins are closer to Eastern Europeans, because of the "teal" component in Yamna (and maybe other steppe admixture), and Palestinians to SW Mediterranean Europeans, because of EEF influence in these. But all this has no or very little relation with ANE itself. I think it's possible that there won't be any ANE in the Near East in any samples from before the Bronze Age, at least in my K8 test anyway. "All them hang ultimately from the mainline Eurasian major branch of Humankind and that makes them different to the so-called "Basal Eurasian" which is comparatively African-like." Again, I believe you have misunderstood this component. It is not more like Sub-Saharan African than any other out-of-Africa population, it is just an earlier branch than all the others. It appears more "African-like" because it spread with agriculture back into Africa. There are several related, but quite major, problems with obtaining useful data from all of these studies. Hopefully, technology will soon make them non-issues. They can only take into account the most common SNPs, because of sequencing errors and the use of arrays for capturing DNA. They also mostly disregard small insertions and deletions, which are highly informative. Once simple programs that can take into account the rarity of SNPs and Indels when comparing samples are developed, and the data quality provides accurate information for this analysis, then things will be much more clear. Right now we are giving rarer SNPs the same weight as more common ones, and completely disregarding the most informative rare ones. The resolution of the data we're getting now is very high, it's just that many people don't like the patterns that this data is showing, so they're simply pretending that these patterns don't exist. What we need at this point are many more data points so that there's no room for any denial. I understand the quality of the data, and how the programs are processing them, and it is quite useful for the rough (but very useful) analysis that is being done here. However. If we were able to actually look at each SNP and indel individually, using their adjacent context of recombination frequency, then things would be much more clear. Someday soon, every locus will be as clear as Y-chromosome and mtDNA haplogroups already are. A recent example of glimpse of this kind of clarity would be the Denisovan/Tibetan high altitude allele. When this can be performed on entire genome scales, then we will know the history of each segment of the genome. The current way we are doing the analysis converts unambiguously useful information into statistics represented by numbers. This was also a problem with early whole genome scale phylogenetics of prokaryotes, where the relationships were smeared out be lateral gene transfer. In eukaryotes like humans, this problem is multiplied at every generation. By using only informative sub-sets of SNPs and indels, and making seperate trees for different haplotypes, we will be able to tell much more from the data. But, as you correctly diagnose. The main problem today is that people just misinterpret the data to fit with the idea already in their mind. Maju, West Asians have much more Basal Eurasian and much less UHG/WHG than Europeans, which can help explain why MA-1 is closer to Europeans. It's like if someone was 80% Africa and 20% East Asian. East Asians will still be closer overall to someone who is 100% Lezgin than that admixed person. The people who keep thinking that Basal Eurasian is closer to Subsaharans seem to believe that they stopped drifting/evolving as soon as they had left Africa. There were no Phoenicians nor Carthaginians in eastern Sicily. Colonies from these people were restricted to western Sicily. And afaik the Greeks were mainly of Doric origin along the south coast and of Ionian origin along the northeastern angle, although there was also Doric and other influence there.